Category Archives for "Dive Computer"
There is nothing more tranquil than plunging into the abyss and watching the rays of light wafting into the water above you. It’s just you and the never-ending blue. You have corals for company and the occasional Great White. 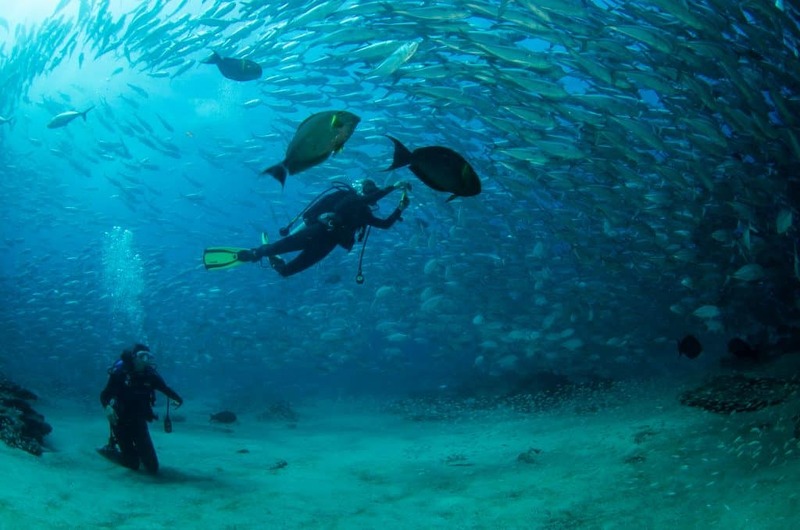 Scuba Diving is fun, it’s surreal, it’s ethereal, and it can be dangerous. If you are a first timer, you want to ensure that you spend more time awing at the many delights the ocean will throw at you, rather than fiddling with multiple pieces of equipment, trying to figure out how much time you have before you run out of air. That’s always the first timers’ most important concern, isn’t it? If you are an experienced diver who scrounges the ocean floor for wrecks, you already know the importance of having a good diver computer. Those wrist-watched sized data crunchers that do all the hard work of computing a thousand different probabilities and displaying on a colorful screen that, ‘Hey buddy, it’s time to head back up. Civilization calls‘. Personal scuba computers can be lifesavers. Not to mention that with a few many additives thrown in, you get exclusive bragging rights in the scuba diving community. But if trying to select one off the shelf doesn’t make your head spin, then you are not aware of the tech specifications and the gobbledygook you will have to navigate through, just to get numbers on the screen. Thankfully, we help you pick the top dive computers for you, irrespective of your skill level or the tech that you are looking for. But before we wear our flippers and plunge headlong into it, let’s quickly take a moment to understand what dive computers are all about and a few desirable features that can make or break you, when you are submerged 100 feet under the ocean. 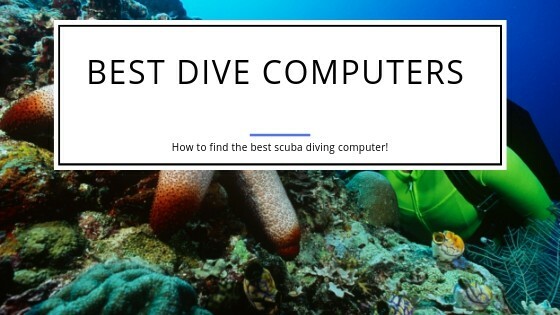 We structured this post by highlighting what you need to know about picking the top choice diving computer for yourself and our suggestions of specific models to look at. First things first, a dive computer is a computing device used by scuba divers that’s worn on the wrist or inside a console. It resembles a smart phone screen and does some lifesaving calculations for you. 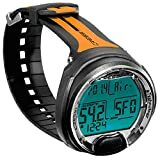 It measures your depth (built-in depth gauge), time of the dive (timer) and then it calculates and informs you about the amount of nitrogen you have absorbed in your body. The higher your nitrogen saturation, the longer time you’ll need for your ascent. It shows this time on a large and often colorful screen that is easily visible under water. Does that simplify things a little? Now it’s time to venture into more complicated turf. How do you pick the best scuba diving computer for yourself? Here’s how. Beginners should stick to the basics. Look for something that has a clear and visible screen and does what it’s supposed to do without you having to fiddle with it. There are a lot of good scuba diving computers which do just that. Some standard features you’d want in one are depth, time, no stop limits, ascent rate, no decompression limit (NDL) or no stop time, emergency decompression and information about the previous dives. More advanced or recreational divers may want additional features like open circuit air/nitrox/trimix compatibility. Your dive computer tracks potentially life-impacting environmental information. Don’t go just for the lowest price on a device that in a certain situation your health could depend on. They build these computers tough to withstand all of these challenges. Just strapping on a waterproof sports watch or slightly improved fitness tracker will not do it. Grab a specialized dive computer that is built to work reliably under those conditions. Flexible straps, scratch and shatterproof screens will make sure that your device won’t let you down when you most need it. You want to see the data large and clear. So look for a big (colorful) screen with a backlit display. A dot matrix display works equally well too as long as it is visible. Some newer models offer the latest technology to display data. Top of the line displays today are OLED based, similar to high-end TV’s. They offer brilliant colors and clarity that is hard to beat and makes reading the data underwater a lot easier. With our trend to make everything smaller you might think having a smaller screen underwater is better. That somewhat depends on yourself. 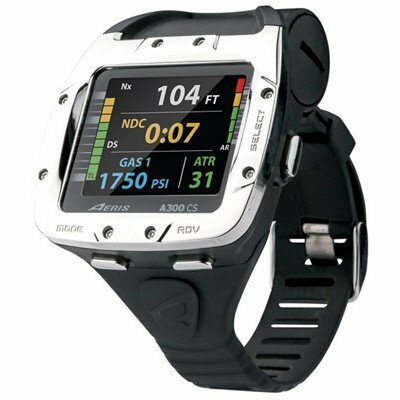 Many divers prefer a smaller screen as they can use the dive watch also on land. However, the purpose of a dive computer is first of all to be able to see important information underwater. Light conditions can vary and it’s hard to read the data on a small screen. Soon this will improve as they will introduce more and more devices that use high-contrast and colorful displays that use OLED technology. Data displayed can in that case easily be read even on a small screen. Specifically, if you are vision impaired or you dive with prescription lenses, then pick a display size that is rather large. It will display the data on a bigger screen making it easier for you to read even if you can’t rely on the corrective lenses in a dangerous situation. Nearly all available models today offer a backlit screen. Even LED or OLED variants use some sort of backlight to produce the vibrant displays on the device. Some older low-end models do not have a backlight. You must use a flashlight or torch to be able to read the data on the screen. Not having a backlight results in less battery consumption. A strong backlight potentially drains the battery nearly as much as the rest of the computer itself. Use it sparingly to conserve battery during diving. If your dive computer does not have a backlight, then shining a flashlight against it to read the display sounds easy. It’s not that easy when you have to fumble for the torch first to be able to read the data on the screen. You should definitely go for a backlit screen as it’s easy to read in darkness and even in sunlight. You’ll avoid having to search for your torch to be able to read the data. One quick thought though. 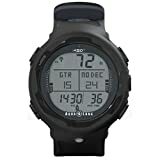 If you’re looking at some of the latest dive computers with OLED based displays, then please know that they have minor issues when you try to look at the display in bright sunlight. Considerations on screen sizes we pointed out above have a direct impact on the weight and overall size of the device. Underwater, the weight aspect is of a lesser importance than on land as you don’t have to lift the weight. Usually, these devices are also too light to make a difference in your weight calculations for buoyancy. However, the physical size of the device can very well have an impact. 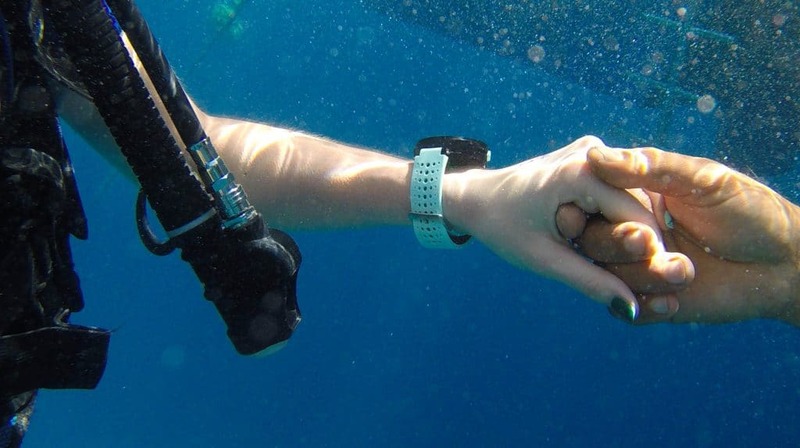 You most likely would not want a huge piece of equipment on your wrist during a dive. It can be a nuisance and you can’t easily get to see the important information. Similarly, a device that’s too small can be hard to grab and read when you’re immersed. Most devices you can get today are reasonably sized and allow for ergonomic handling underwater with or without gloves. Some technical dive computers end up on the larger side. They have a lot of features that need to be packed into a device so you potentially have to get used to such a larger device on your wrist if you get into sophisticated technical diving. Lastly, having a small device works well in warm environments where you’re probably only wearing a rash guard. 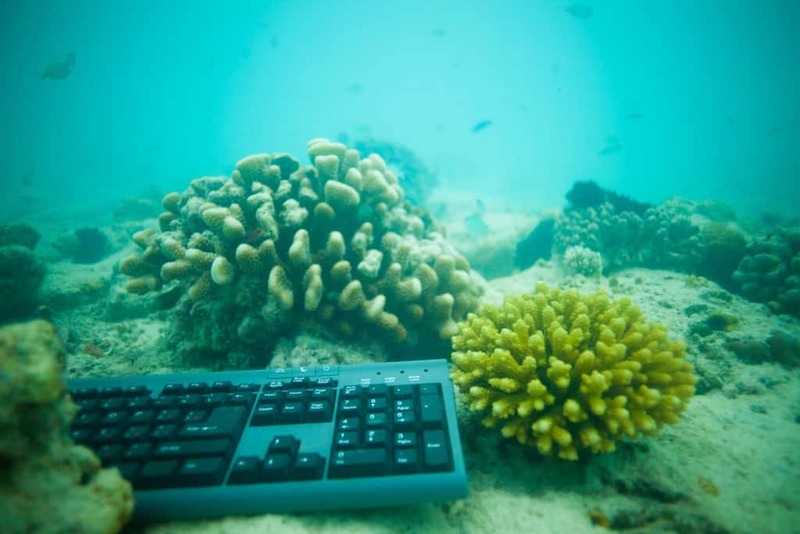 If you dive in colder waters and you need a wet suit or even a drysuit, then most of these small computers offer the problem of not having a long strap. You will have trouble to mount them on your wrist on top of your suite as the straps are not long enough. As we said before, you don’t want to be fiddling too much with your dive computer under water. Look for something that’s as hands free as it can be. For the tasks that demand your fingers, look for models with large buttons. Remember that you potentially will wear thick gloves. Another aspect of being user friendly is how you prefer to navigate through the different options. Some entry-level models offer a single button. While this is simplifying things on one hand, it makes it harder on another. If there’s a few menu options then using one button can make life a lot easier. Multiple buttons are necessary when you have a device with many features. In that case it’s easy to navigate to the specific option/display you’re looking for without having to step through the whole set of menu choices. One thing many don’t think about is that your dive computer should be comfortable to wear. It’ll be with you at every dive and one thing it should not be is that it irritates you. If you intend to use a small system you wear on land and in water then check that the straps are comfortable to wear all the time. If you use them on top of your wetsuit, then a slightly rougher material might not be an issue. If you wear it on your skin all the time, then you want something that can be worn comfortably. 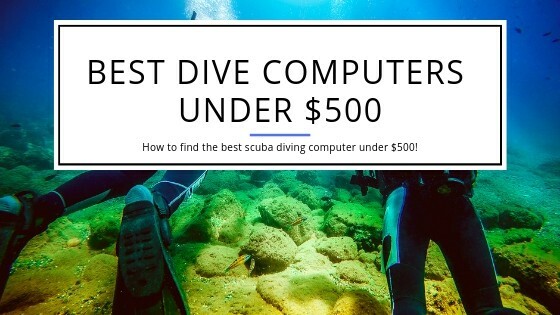 The average price for a personal scuba computer with standard features is around $250-$500. Advanced ones will make you poorer by $800-$1000. Beginners should pick an entry-level device that is not only more affordable, but that reduces the complexity of the computer. More features usually result in a higher price. If you want a technical dive computer where you can change algorithms, have air integration, an integrated compass, etc. then you not only have to expect to pay more but you will also need to get a much better understanding of how to use the system. You have two different styles to choose from. One is a wrist watch styled dive computer which once again has two different varieties, one that looks like a hockey puck and the other which resembles a normal wrist watch and can be worn on land too. The second style is a console or boot mount styled computer that has all the features packed into a compact device. You can often find the same device to be available in either a wrist- or a console-mount. It is somewhat of a personal preference and not necessarily a safety or capability question on which type to choose. In our opinion it can be easier to use a wrist-mounted system as you always know where it is. A console, if not setup correctly, can have a life of its own and you potentially could end up trying to look for it. It can be a problem if you end up in a dangerous situation and you’re not instantly able to see the data you’re looking for as search for the console first. Pretty much any modern dive computer will offer you several modes. Most common in all models are gauge mode and air. Nowadays pretty much any device will also be able to deal with at least one nitrox/gas mix. If you’re thinking of venturing into technical diving, then having a computer that provides different models to deal with gas blends is of essence. The modes to consider are multiple gas mixes including Tri-mix you can switch during a dive. If you also enjoy freediving, then you want that mode to be part of the offered features. Technical divers that use a re-breather require a computer that can calculate limits for re-breathers. All dive computers use an underlying algorithm that is tracking your absorption of nitrogen under pressure while you dive. These algorithms are based on a variety of different models and the goal is to keep you safe while you dive. Every manufacturer has their own little tweaks on this and these algorithms are not all the same. Some are more conservative (less time underwater) while others are possibly even based on different models and are more liberal (more time underwater). Nearly all available computers will allow you to influence and adjust the calculations. Usually, it means you can change them to be more conservative. This can be a good idea specifically if you are a beginner or just diving again after a while. You’ll often experience these differences when you dive with a buddy or group where everybody has a different brand of dive computer. Some will alarm for decompression limits earlier while others will do that later. If you don’t cheat your dive computer, you should be safe no matter how conservative or liberal the calculations are. Oceanic tries to overcome this dilemma by having dual algorithms in their computers. You can pick which algorithm to use when you dive with a group or buddy that uses a different brand. That way you get your calculations close to each other. Last but not the least, air integration is one of the most sought after technologies in the top dive computers. It allows you to connect it to the oxygen tank using a transmitter and it will display the amount of air time remaining and the PSI reading of the tank. This sounds straightforward but there are a few things you need to consider. First, how do you want your air integration to work? If you use a console mounted dive computer, then it might have a pressure gauge integrated that connects to your tank via a hose. Otherwise, the most common air integration is done through wireless transmitters on your tank. These typically work well. If you are a dive guide or teacher, then you might need a more advanced setup where you can wirelessly track the air levels of all the members of your group. You can find dive computers that can connect to multiple wireless transmitters allowing you to track the pressure in each tank so you can safely get everyone to the surface. One often overseen aspect of your dive computer is to be able to log your data and to download it to your PC. Log capabilities are different in nearly all devices and some can store data for many dives while others have a limited log capability. The latest generations of dive computers often offer Bluetooth connectivity with your smart phone or computer. You can download your dive data wirelessly. Other options are that you can connect through a USB cable which most times is optional and will cost you extra. Being able to analyze your dive log can be helpful. 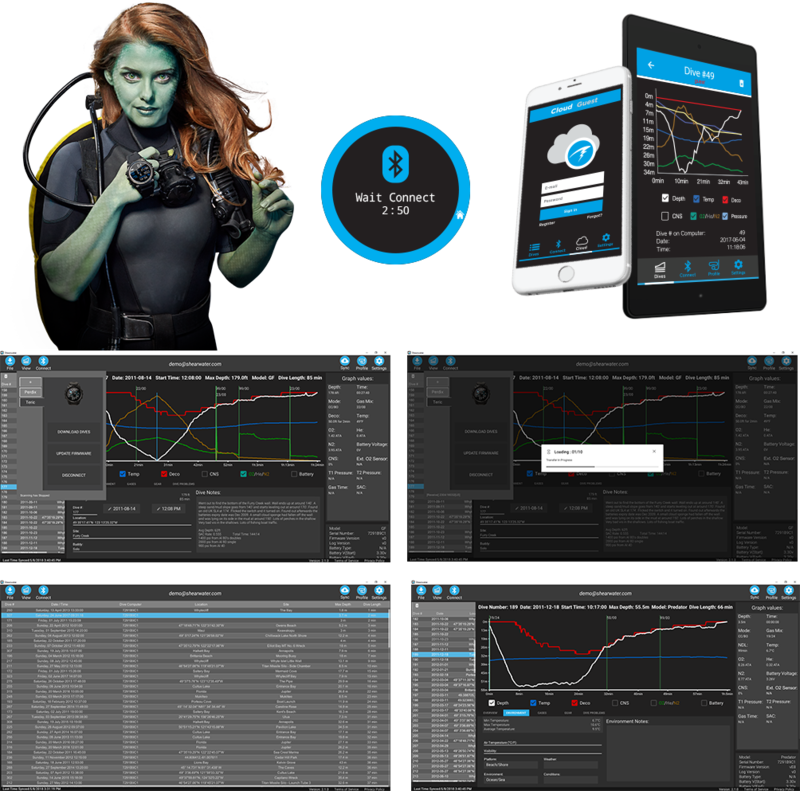 Not only does it give you bragging rights, but you actually can compare the data collected on different dives, so you can work on your air consumption, etc. That might not be your priority but once you gained enough experience, it can be an interesting aspect of using a dive computer. All dive computers run off batteries. Some even come with rechargeable ones. That sounds at first glance like a great thing but is it? Having a rechargeable battery has advantages. First, you won’t have to change the batteries when they are empty. However, it can be quite a negative when you’re on a dive trip and you forgot the charger. Once the battery is drained you’re stuck with no computer. The potentially best solution is that you get a dive computer where you can change the batteries yourself. In that case you have a spare battery with you or at least you can purchase one of these standard batteries pretty much anywhere worldwide. The downside is that you will have to open the case to change batteries. Make sure that the system is protected from water after you change and most battery replacement kits from the different manufacturers include O-rings that should be changed, etc. Keep the issues listed in the above buying guide in mind. We have compiled the list of the best dive computers for 2019. We highlight their strengths and weaknesses and also suggest what each model is best used for. It’s not that easy to introduce the Shearwater Research Teric. Why you wonder? It’s just an amazing new dive computer that was introduced recently and it’s hard to figure out what would be missing. The screen is amazing. Yes, it’s a smaller size and you use the Teric as an everyday watch if you have a large wrist but it’s crystal-clear and displays all important information. You won’t have any issues reading the data underwater. The Teric is the best technology available today packed into a top-quality case that also looks quite attractive. The glass is made from sapphire crystal and is highly scratch resistant. Even hard impacts won’t result in a broken display! You navigate the features in the menu through four separate buttons along the sides of the case. You can even program one button to quickly get you to a specific menu option. The screen itself can be configured to show any data you want in whatever font-size and color you prefer. The dive watch is a little large to be worn every day (except if you have a pretty large wrist), and it is designed to not only have vibrating and audible alerts for dive limit violations and warnings but also so you can have up to two daily alarms. 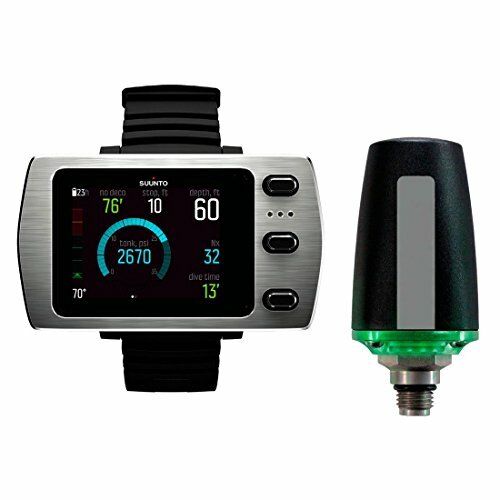 Even more amazing is that this small device comes with an integrated 3D compass for diving. The readings are displayed along the outer edge of the display making it easy and intuitive to use. The Teric offers air-integration. You can connect it to two separate wireless transmitters to track gas and air consumption in up to two tanks. It can deal with Air, Nitrox and Trimix. You can even use it with a re-breather or in freediving mode. It comes with a rechargeable battery you can’t replace yourself. Battery life is up to 50 hours between charges and you can charge it wirelessly. The Teric has a logbook with up to 500 hours of dive data. You can connect it through Bluetooth to your PC or mobile device to offload and analyze your dive information. 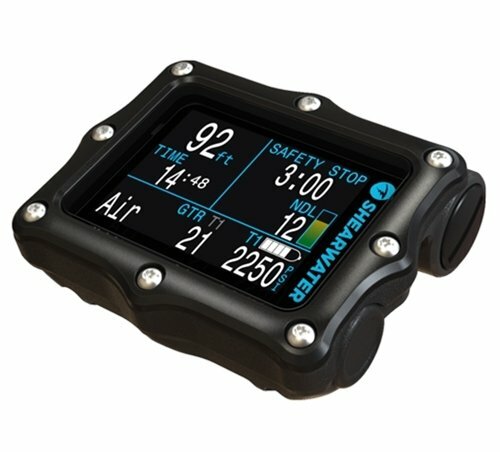 We’ve evaluated a lot of dive computers and this is truly the best we have come across in our opinion. 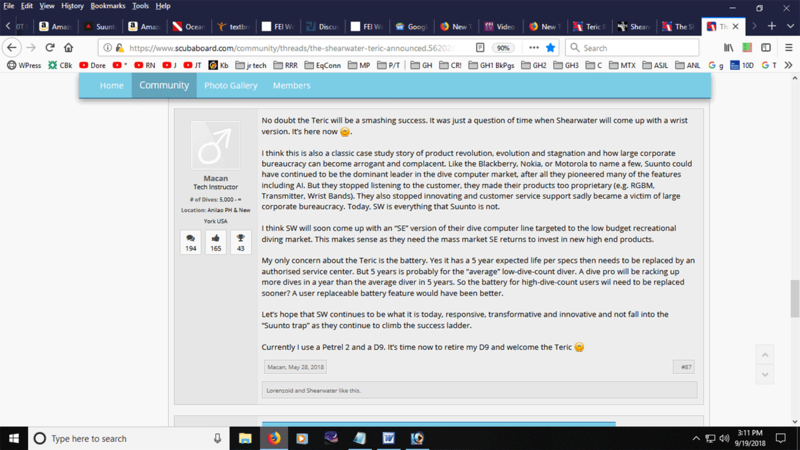 You can also have a look at our in-depth review of the Shearwater Research Teric to get a better idea whether this is the right device for you. There’s not much else to say than ‘Wow’. The Shearwater Research Teric offers it all. It’s overkill for a beginner. Otherwise, it’s a great scuba computer that has all the features and functions you could ever require. 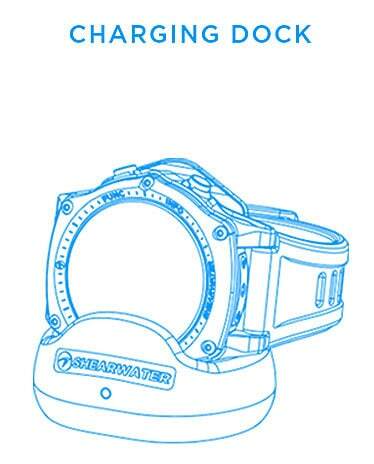 We honestly don’t know why anyone wouldn’t be excited to have this technological marvel to keep you safe underwater. The only reason not to look at the Teric is if you’re opposed to wrist-mounted diving computers. Besides that, it’s hard to imagine a better computer on the market at the current time. One of the most important features that beginner divers look for, is to get access to important information when they need it the most, without having to fiddle through unwanted screens. That’s precisely what they get with the Cressi Leonardo. With a one button user interface to get information and customize the dive computer, it is one of the most user friendly models in the market. You can toggle through the various modes and settings in the blink of an eye without getting lost while doing it. The Leonardo features a module design which allows you to use it as a wristwatch and also remove it and mount it to a console. It comes in a variety of color combinations. It includes an air and Nitrox mode (up to 50%), has a large segmented dot-matrix backlit display which displays all the information clearly. While it uses a conservative algorithm, it offers users enough options to tailor this level. An in-built log stores data for up to 60 dives and there are critical audible alarms to sound the most important information. The backlight is not the strongest and could use improvements. We’ve compiled a detailed review on the Leonardo if you want to dive deeper into what it offers and what features you’ll be missing compared to more expensive alternatives. 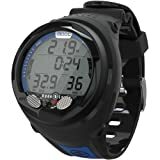 This is a great dive computer for beginners and also a great choice for a backup dive computer for recreational dives. If you’re willing to spend a little more, then check out the Cressi Giotto (click here for a detailed review). It’s a step up and offers some better features. You can also check out our head-to-head comparison of the two devices to learn more about the differences in detail. 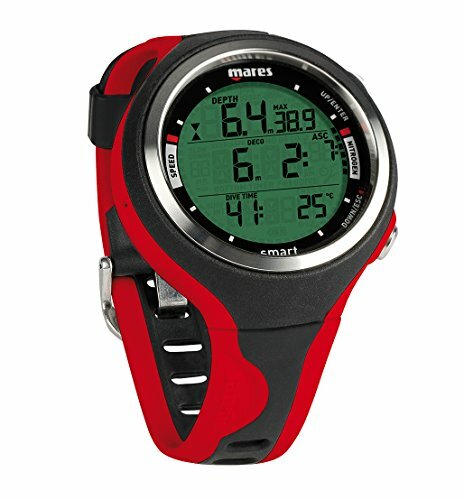 The Mares Smart is a minimalist but efficient entry level dive computer that trumps a lot of high-priced models with its intuitive user interface and two button control. It may lack the bells and whistles you’ll find in higher end devices. But it more than makes up for it with its well thought out dive mode screen and comprehensive data. It has a stylish and sleek design with both the buttons and the bezel ring made of stainless steel. This also gives it a more solid feel unlike flimsy all-plastic models. The Smart can also double up as a sporty wrist watch when you are not diving. It comes in a variety of colors to match your style. 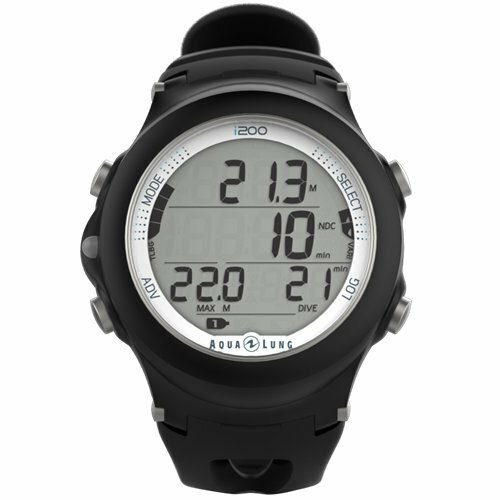 The main display shows you the vitals such as NDL, water depth, dive time and temperature. Besides this, there is an ascent rate indicator and tissue loading bar graph. There is an alternate screen which shows the gas mix, the average depth, the max depth, the current time and the oxygen toxicity. The two button controls make it easy to change the screen. The top button can be used to tweak the settings in the upper part of the display and the lower button allows you to navigate through the alternate displays. It allows two gas mixes (21 – 99% Oxygen) and the Surface interval countdown is another stellar feature of the Mares Smart, which makes it a versatile choice at this price point. There are visual and audible alarms for critical alerts and the backlight is excellent allowing clear visibility even in the dark. If you make the noob mistake of ascending too quickly, it sounds an alert with a large ‘SLOW’ on the screen. We’ve compiled a detailed review of the Mares Smart that you can find here. It’ll go more into depth on showing the available and missing features of this model. Priced at under $350, the Mares Smart offers enough features to make it a great buy at this price point. It may be considered as an entry level dive computer because of the innocuous appearance and lack of a colored display. But it packs a punch with its features and is even used by professional divers. 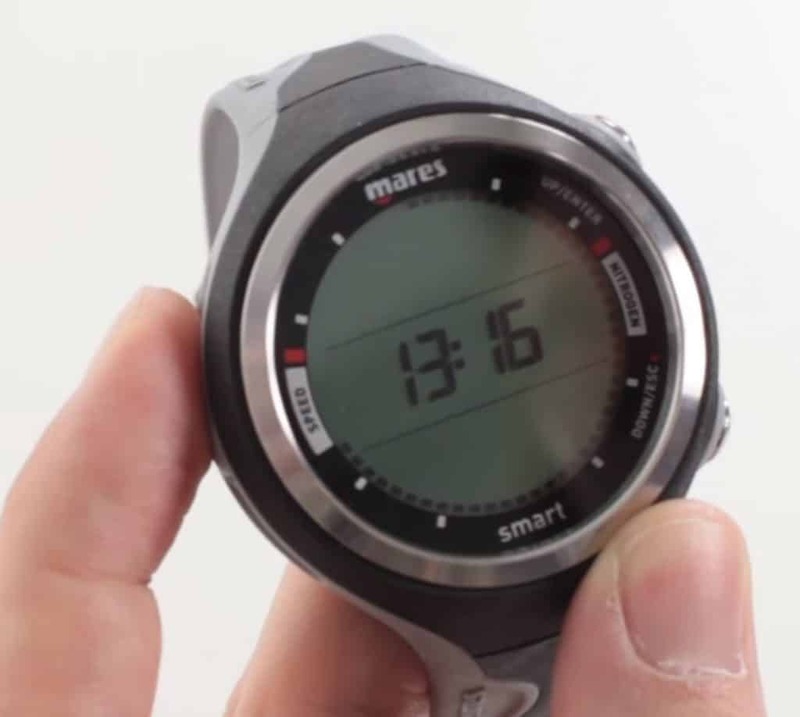 Mares introduced another model of the Smart that comes with air integration. It’s basically the same set of features as the Mares Smart except that it offers (optional) air integration through a wireless transmitter on the tank. 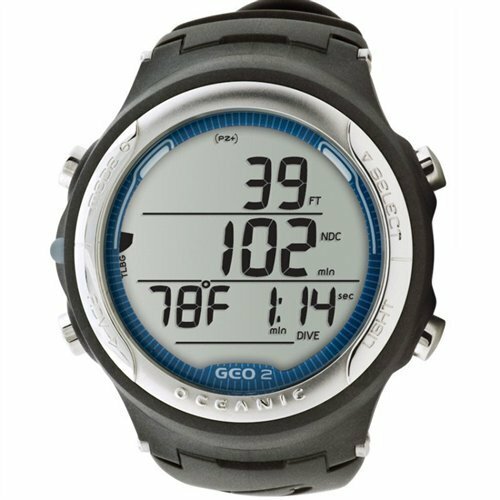 The Oceanic Geo 2.0 is a somewhat unique, affordable computer that targets beginners and recreational divers. What makes it unique is Oceanic’s dual algorithm setup. You can switch between two different versions which makes it ideal if you’re often diving with different buddies. You can pick which algorithm to use based on what dive computer is used by your buddy. That will give a more equal match of computations and you are closer matched to the alarms and warnings of your partner. The Geo is a wrist-watch sized device you can wear all day. It comes in several color combinations. It doesn’t have all the bells and whistles of more expensive devices but it has features you wouldn’t necessarily expect at this price point like automatic altitude adjustments. The display is a little cramped, but it’s still easy to read all the information shown. The backlight is good and allows to read the information in less than perfect lighting conditions. Navigation of the menu items and overall use is simple through four buttons placed evenly around the display. The Geo 2.0 can handle two gas mixes that can range between 21% and 100% Oxygen. The dive log is small with data being kept for up to 24 dives. They do not offer air integration for the Geo. That’s not surprising at the price point it’s offered. Besides that, it offers anything a recreational diver could look for. You can even switch the battery by yourself. You can checkout our in-depth evaluation of the Oceanic Geo 2.0 here. There you can find a lot more detail on this amazing dive computer. The Geo 2.0 checks all the boxes for an entry-level and recreational dive computer. It offers Oceanic’s unique dual-algorithm setup which makes it easy to adjust your computer to the one of your buddy to avoid getting alarms and warnings that don’t line up. The logbook is small and if you are looking at a scuba computer with air integration, then you’re out of luck with the Oceanic Geo 2.0. The logbook can easily be downloaded to a PC so you usually won’t run into an issue losing any data. The only time it can be a tight squeeze is if you go on a longer dive vacation and don’t have a PC with you. For the price you pay you get a stylish dive computer you can use every day. It’ll last you for years to come until you require additional features like air integration. If you like to have the dual algorithm setup, then you’d be looking at the Oceanic OCi at that point. We have a detailed review of this device to be found here. The Vyper Novo is the upgraded version of the very successful and widely used Vyper (check the differences between the Vyper and the Vyper Novo here[GS16] ). The Novo model received some impressive upgrades like air integration, handling of multiple gases, etc. These features make it also one of the best scuba diving computers you can find today. It’s a great device if you’re an experienced diver but is also not too complex to be managed by a beginner. The Novo can manage up to three different gas mixes. Compared to models that are sized like a day-to-day watch, the Vyper Novo is large. The benefit is that the larger display shows all important information at-a-glance. The number of buttons to press to get any information you might need is minimized. This way the gadget is what it should be, a device to help you stay safe while diving and not yet another technical nightmare you need a PhD to understand! The large size makes it easy to press the buttons even when you wear thick gloves. The display is sharp and easy to read in any light condition. The backlight allows to see data even in the darkest spots under water. We prepared an in-depth evaluation of the Suunto Vyper Novo. Check it out if you’re interested in this particular model that’ll be a trusted device for years to come. ​Large size which can’t be worn as a daily watch. 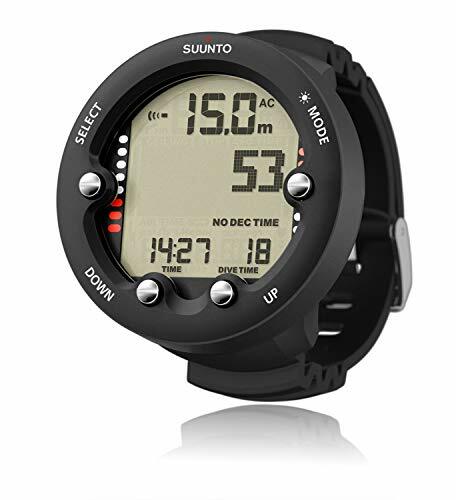 The Suunto Vyper Novo is a feature-rich scuba computer that offers everything that an experienced diver needs. As a recreational diver there are no capabilities you could require that are not delivered. The features you get even include a 3D compass. If you combine that with the wireless air integration you end up not needing a bunch of other gauges and devices. Even if you are in your early days of diving, you can have a closer look at the Vyper Novo. The air integration can be something you add later as it’s optional. The base device offers features that will be satisfactory for years to come! The Atomic Aquatics Cobalt2 is our pick for the best console mounted dive computer. It’s feature-rich and offers a brilliant color display. 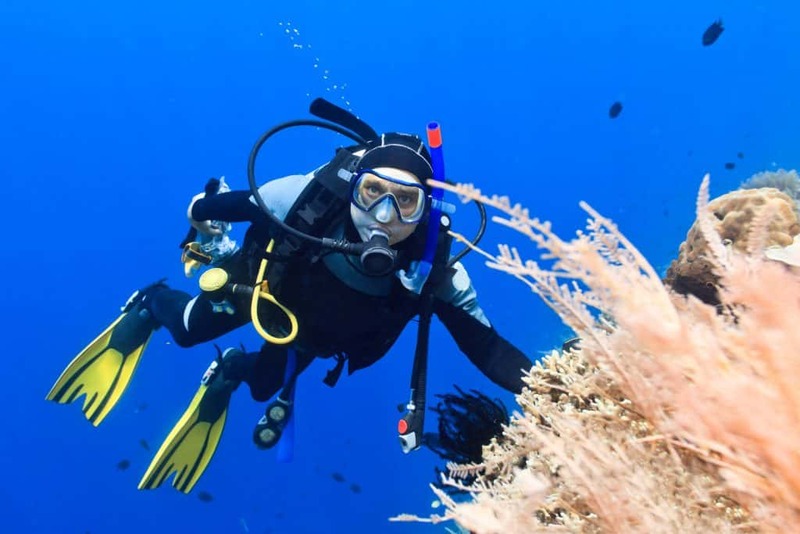 It offers all the bells-and-whistles you could look for as a recreational diver that uses air or nitrox for diving and prefers the console setup over the wrist mount. Most other manufacturers offer a range of dive computers to choose from. Atomic Aquatics offers only the Cobalt 2. For good reason as it is a solid system that will usually not have you missing any features if you dive recreationally. The display is colorful, provides graphics and can be configured by you. You can set up what data you want to see on the screen. Navigation is performed through four buttons on the device. The computer offers air integration. 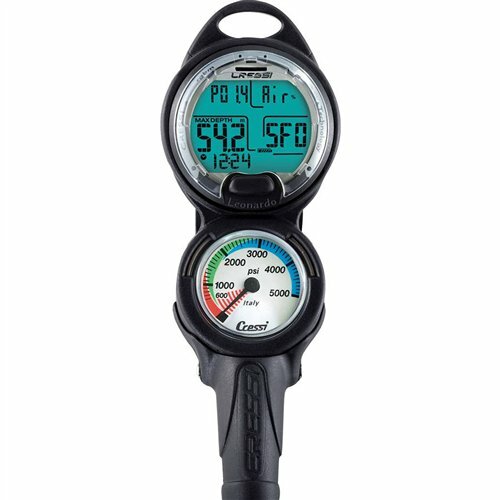 It uses a hose to connect the Cobalt 2 to your regulator to measure the pressure in the tank and display it. Another high end feature that is part of the device is the integrated 3D compass. Having a rather large and colorful display helps with being able to get an instant view on your bearings through the compass. It can be harder to use a compass on smaller screens. There’s a lot of menu options for you to choose from. You can easily navigate through them with the four buttons on the bottom. The Cobalt 2 allows to switch between up to six nitrox gas mixtures. The computer is powered by a built-in lithium ion battery you can recharge. Each charge allows the device to work for up to 60 hours so be sure to bring the charging cable if you go on an extended dive trip. The logbook is large at around 600 hours of dive time. The color display makes it easy to display detailed dive data from past dives including graphics. You can connect the Cobalt2 to your PC to download dive data through USB cable. The Atomic Aquatics Cobalt 2 is a console-mounted dive computer that leaves no wishes unfulfilled. It offers features you expect from a high-end device such as this. Having air integration and a 3D compass together with up to 6 different nitrox mixes makes it a great scuba computer for experienced divers. The only things you might miss are trimix or rebreather setups. We’re also not that excited about the rechargeable battery. While in theory it’s great and environmentally friendly we think a user-switchable battery is helpful if you are on dive trips where you potentially have a hard time to find a charging possibility. The Oceanic VTX has a visibly different design than many other diving computers. The screen alone is amazing and displays the information clearly and in vibrant color. The overall navigation and usage of the device is easy. The buttons are placed strategically and can be used even when you’re in thick gloves. The VTX is worn on the wrist. It is a very specialized device so it can’t be worn as a regular watch! Looking at the features it is amazing though to have all those capabilities packed into a reasonably small device. The Oceanic VTX targets experienced divers with demanding needs for features and data. It is feature rich and allows to do a lot of data gathering and programming. It easily connects to a computer through Bluetooth. The log book is a little on the small side with enough capacity for around 24 dives. Going on a scuba vacation might push you over the limit here. The other caveat is that the battery life could be a little longer. It’s around 20 hours. Diving trips where you’re not having a computer handy to offload dive data and where you use the computer more than usual can easily end up with frustrating moments where you run low on battery and/or dive log! The Oceanic VTX is definitely considered a high-end scuba diving computer. That’s not only reflected in the features and capabilities it offers but also in the price. Besides all the bells and whistles that this device offers, the highlight is the display. Colorful and vibrant, yet very clean. It shows all information you need in a clear and concise way. If you’re not an experienced diver and do not you require all the data collection so you can slice and dice it as you please, then you’ll definitely find other scuba computers that are cheaper and offer a set of features that matches your needs. The VTX has it all but that can end up being a little too much for many divers. The Shearwater Research Perdix is one of the latest and flagship offerings from the Canadian manufacturer who commands a cult following among diving enthusiasts, ever since they launched into the market with the ‘Predator’, their first dive computer. The Perdix is an upgrade worthy of every accolade it is receiving. This is a smartly designed dive computer that can be taken along for anything from recreational dives to deep water technical dives. It is small, has a slim profile and a long-lasting battery. What greets you out of the box is a large 2.2-inch color screen display with ample space for displaying all the information you’d ever need. You can see adaptive safety stops, the number of stops, the depth and the duration of stops that is tailored according to your dive time and previous dive history. The Time to Surface is displayed clearly and shows you the most important information, considering all the safety stops. 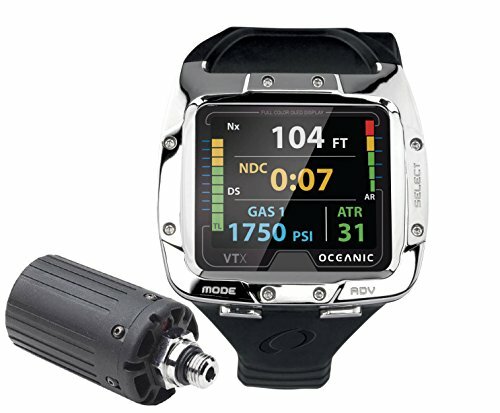 You can customize or choose from four different dive modes, OC recreational, OC technical, CC-INT and gauge. It’s aimed at advanced and technical divers and can handle a rebreather. Nothing. This is one of the top dive computers that you can invest in. The Shearwater Research Predix bridges the gap between a recreational dive computer and a technical one. It is a flawless package. If you intend to go beyond the average recreational dive or into deeper waters, this is what you need. How much does a dive computer cost? Dive computers are not a cheap piece of your scuba equipment. On the low side you must estimate at least $200 to $300 to get an entry-level model. On the high-end side you can expect to spend more than $1,000 for the personal dive monitoring device plus a few hundred for wireless sensors. However, there’s really no ceiling on how much you spend. Should beginners use a dive computer? There’s no doubt that any diver should use one of these decompression calculators. 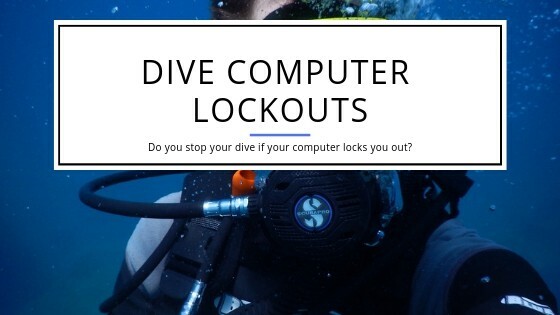 Whether you’re a beginner or an experienced diver, these computers will keep you safe and out of harm’s way. You can use dive tables to calculate your dives but the real-time tracking you get from using a computer can’t be overvalued. It adds a level of safety as it measures data during your dive while using dive tables only allows you to plan your dive without taking the actual data into consideration. A dive computer takes the guesswork out of whether you should do a deco stop, need a safety stop or whether you can just ascent slowly and safely. Tracking your dive history also allows to take remaining nitrogen levels in your body from previous dives into consideration. What is air integration on a scuba computer? Basic devices only monitor and track the time you spend underwater and the depth you reach. You still need a console that measures the air left in your cylinder and provides (usually) a compass to help to navigate. More feature rich dive computers usually offer (optional) air integration. Most modern systems connect your dive computer to your tank wirelessly. You have to connect a sensor/transmitter to your tank that then provides the information for your dive computer. This way you can track the pressure in the tank and the dive computer can calculate time-remaining, provide warnings on when to come up, etc. How does a dive computer work and what is it used for? A dive computer is a computational device that tracks in the simplest case your time underwater and the depth you’ve been diving to. It then uses an algorithm to provide you with data on when you have to come up, what decompression limits you have to adhere to, etc. The data is used to compute limits on ascent speed and timing to prevent decompression sickness for the diver. 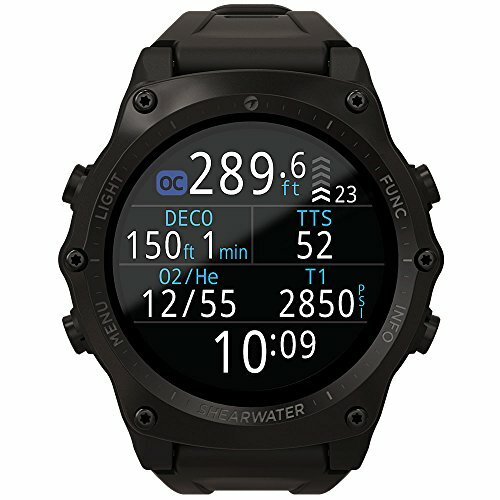 Higher-end personal decompression computers will also track multiple dives, air consumption, provide navigational help with an integrated compass, etc. Technical dive computers also let you influence the limits for diving to push boundaries and analyze collected dive data. What do you do when your dive computer stops to work in the middle of a dive? First things first. The safest action is to end your dive. 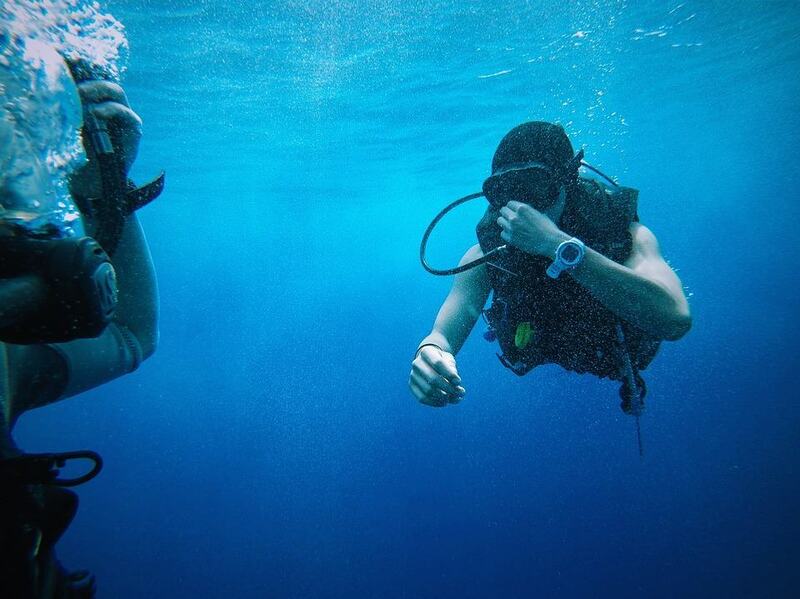 You’ll signal your dive buddy to call the dive and start your ascent together with him or her. Use her dive computer as a guide to do your ascent. If you and your buddy have different dives just before the current one then add a safety stop on your ascent to make sure that his or her computations don’t endanger your health and potentially lead to decompression sickness. Once you’re safely above water, you want to change or charge your batteries. That should get you back on track quickly. Some divers also have a backup computer with them. If you do then use that but keep in mind that the calculations can be off if the backup does not have all the dive data from your previous dives! 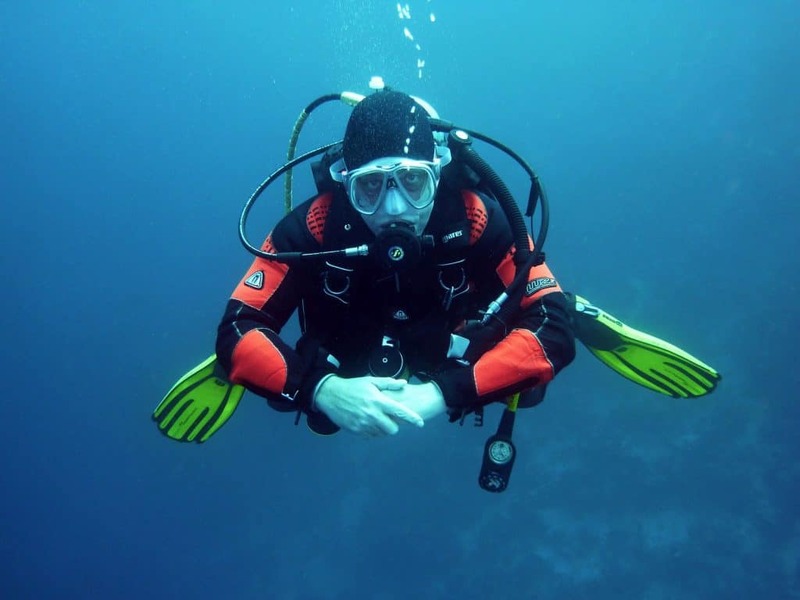 What is Nitrox and Trimix diving? 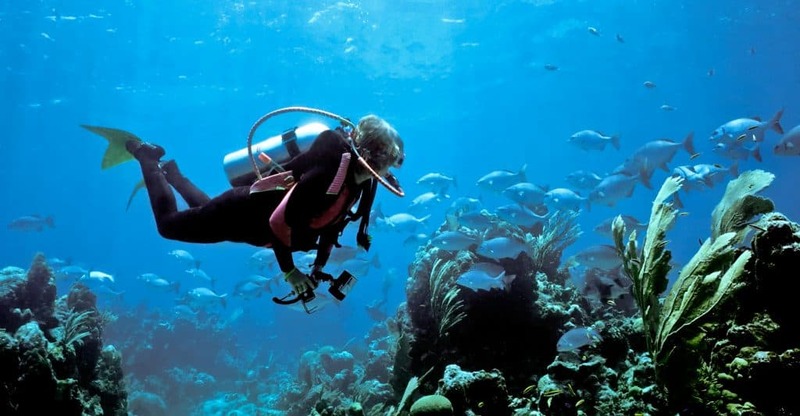 Most recreational diving is performed using compressed air. If you want to be able to extend your time underwater, then using Nitrox gas mixes can help you with that. In that case the amount of oxygen is increased in the gas mix to allow to stay underwater longer. This has side-effects you have to be aware off though. You can read more here. Trimix adds Helium to the gas you’re breathing underwater. This is necessary to prevent negative impacts of high oxygen and nitrogen levels underwater. Specifically, it’s used for commercial deep diving. It can go as far as a mix of only Oxygen and Helium which is known as Heliox. Do you still need to use Dive Tables when you use a Scuba Computer? There’s technically no need to use compression tables when you use a diving computer. All the calculations done with the tables are handled in real-time with the computer. Having the computing device take over results in much easier, yet usually safer diving. Your computer tracks your dive history automatically and you don’t have to constantly take that into consideration when you try to calculate your safety and dive limits with the help of dive tables. This makes using a dive computer a much more reliable and safer planning and tracking tool than the old-fashioned tables. However, you should still be able to use the tables to calculate your dives so you get a better understanding about those limits and where they come from. We hope you enjoyed browsing through our list of the best dive computers. We have tried to include a few entry level models, something mid-range and something for the serious guys to play with. Always do your research and make an informed decision. 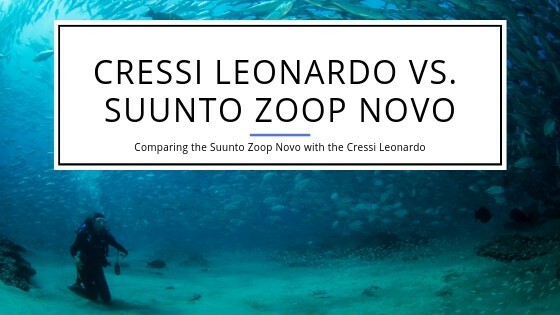 ​Both the Cressi Leonardo and the Suunto Zoop Novo are dive computers designed for the beginner diver. They are affordable and provide a set of capabilities that matches the entry-level diver. At first glance both dive computers are not that different. They both come with large screens which makes them too large to use and wear as a day-to-day watch. The first difference you will see is that the navigation on the Cressi Leonardo uses a single button. 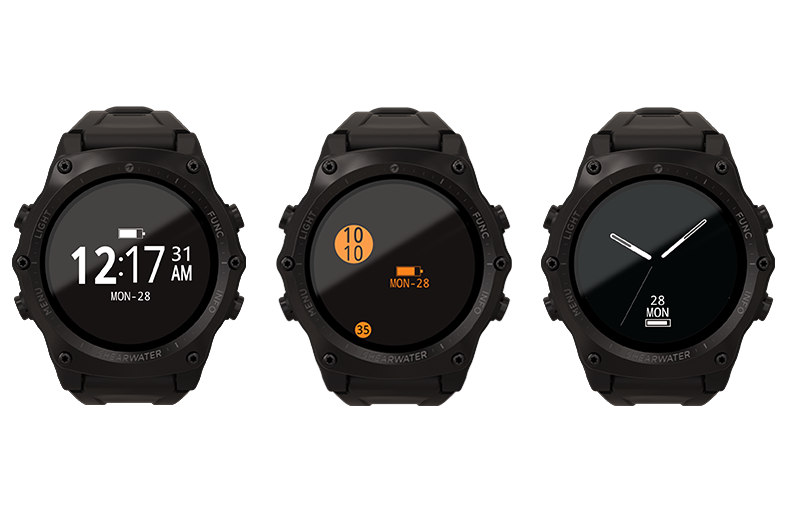 The Suunto Zoop Novo features four buttons to navigate through the functions. Both approaches have their advantages and disadvantages. The upside of a single button navigation is that it’s super-easy to use and that you can’t confuse any buttons when you dive with gloves. The downside is that you have to step through all menu items to get to where you want to get. Using multiple buttons to navigate allows you to reach certain menu selections faster as you don’t have to step through all of them. However, you have to memorize which button does what and if the buttons are too close together, you can easily confuse them or not be able to touch the right one if you wear thicker gloves. The Suunto Zoop Novo features a good compromise in this area as the buttons are spaced very far apart so you won’t press the wrong button by accident. While the navigation has differences by how many buttons you have to use, the overall functionality of both dive computers is not that different. Both offer the basic features you will need to dive safely. They both can handle Air, Nitrox and Gauge modes. The Suunto Zoop can also handle free diving and has an off mode. 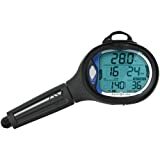 This can be helpful if you hit the water but don’t want it to measure any time or depth which would impact your next dive. One feature that the Leonardo has which is helpful for dive shops is that you can reset the dive computer. This allows dive shops and dive schools to have the dive computer start fresh for every new diver. When you use the Leonardo as your dive computer then do not reset the device. 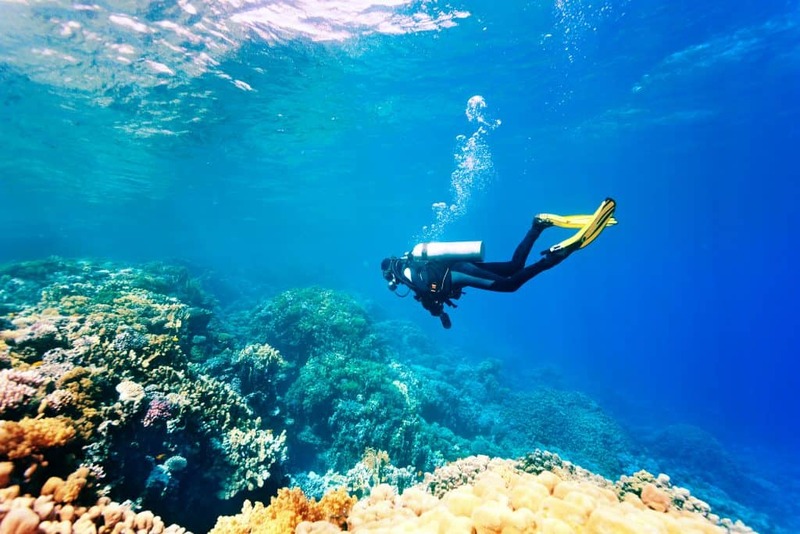 To calculate the correct and safe times for your dives, it requires having information about your previous dives available. If you reset between two dives to gain more time underwater, you can risk your health! The Zoop Novo only comes as a wrist dive computer. The Leonardo is available as a personal wrist dive computer and a console. It comes in two different console setups. One with a pressure gauge and the other with a compass. The logbook on the Suunto Zoop is larger which means you can store more dive data on the device itself. Both scuba computers are capable to connect to a PC or Mac to transfer the data off of the device. You can then analyze and store the data on your PC. You can also plan future dives based on those historic records. If you dive a lot and want to share your dive data with your friends and family, then the Suunto offers the better features for that. You can upload the data from your dives to the Suunto Movescount portal where you can add pictures, video and geo-location. This allows you to create a multi-media scrapbook of your dives and share it with the world! Both dive computers can handle Nitrox up to 50%. They are, as is to be expected with an entry-level model, not capable to switch gases during a dive. More sophisticated capabilities like these can be found on higher end devices. Both dive computers use an RGBM model for their calculations. The Zoop Novo uses the Suunto own RGBM while the Leonardo is using the Cressi RGBM. 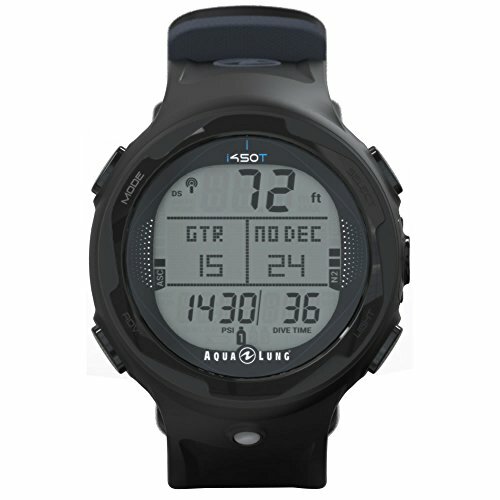 Overall, the Cressi algorithm is a little more liberal while the Suunto is more on the conservative side. It’s hard to say what is better. 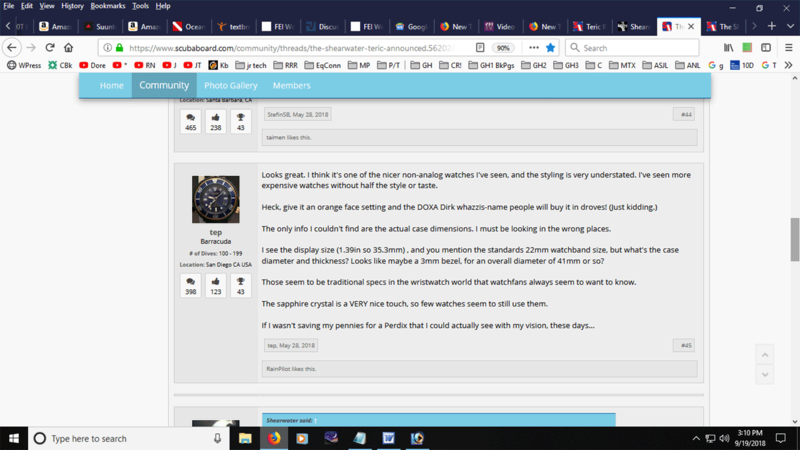 The one thing you want to keep in mind is that if you for example use a Leonardo and your dive buddy uses a Zoop Novo then the Suunto algorithm might require a deco stop while the Leonardo does not (yet). As already mentioned, the Cressi Leonardo offers the ability to do a complete reset. This makes it a great device for dive schools and dive shops that rent out equipment. The reset will erase all data from previous dives and all calculations will start with no consideration of the past. Other than being an advantage for this specific use case, there’s no advantage if you own the dive computer and use it as your personal scuba watch. In that case it can be problematic if you reset the device to have it ignore previous dives. You can endanger yourself and your buddy/buddies if you do that! Neither of them has air integration capabilities or a digital compass built-in. That is not a problem for beginners and divers that don’t dive too often. The lack of more sophisticated features doesn’t allow either of these devices to grow with your experience. This does not mean though that you will need more features anytime soon if you start to dive. You should easily be able to dive for a few hundred hours before you reach the point that you would require more functionalities. Even then you can use either of these dive computers as a backup to a higher end model. 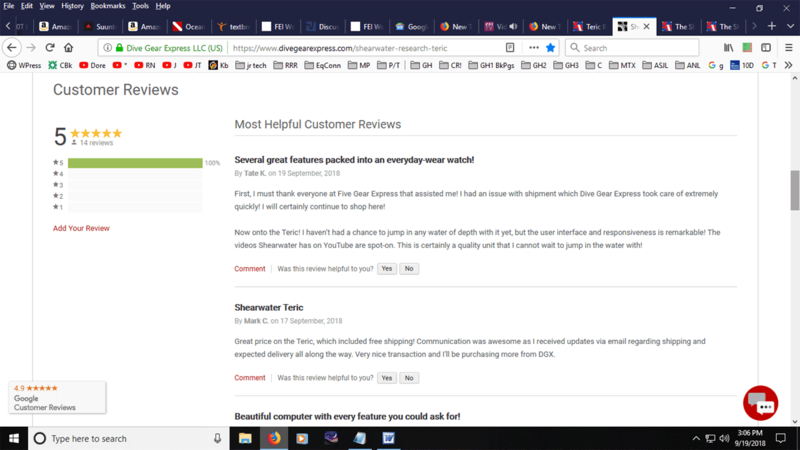 If you want more information and detailed reviews of both devices, then check out our in-depth reviews. We have a closer look at the Cressi Leonardo here where you can find out all the details you need to know about this model. If the Suunto Zoop Novo is more of interest to you, then have a look at our in-depth review that you can find by clicking on this link. 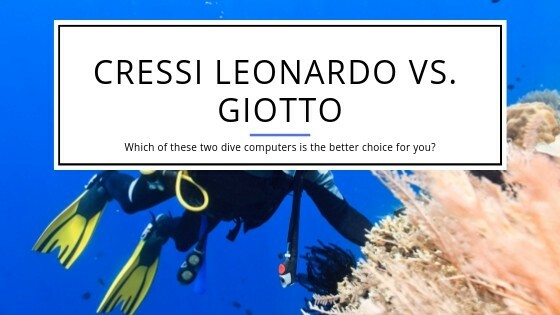 If you want to check out how the Leonardo compares to the Cressi Giotto, then check out this post where we highlight the differences between those two dive computers. We also had a closer look at the differences between the Zoop Novo and its predecessor the Zoop. The Zoop Novo is a good entry level dive computer. 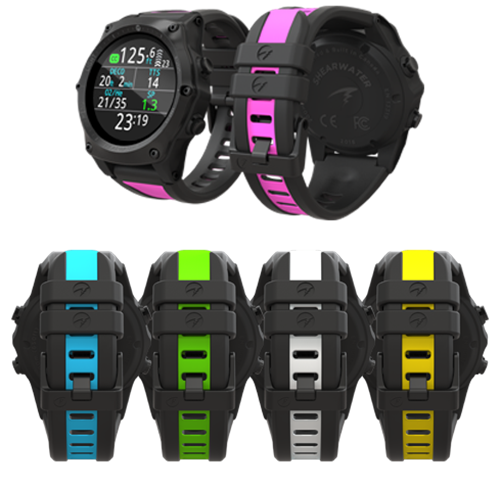 The next level up in Suunto’s lineup is the Vyper Novo. You can get an overview of the differences between these two devices in this comparison. One of the major differences when looking at any more sophisticated models is that they will offer functions to track your air consumption among other higher-end features. Either of these dive computers is a great choice for an entry-level diver or if you dive only a few times a year. There’s no need to think of a device with more features that costs more. 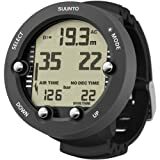 If you are beginning to dive and you think you might end up diving a lot, it still would make sense to start with an entry-level device such as the Suunto Zoop Novo or the Leonardo Cressi. 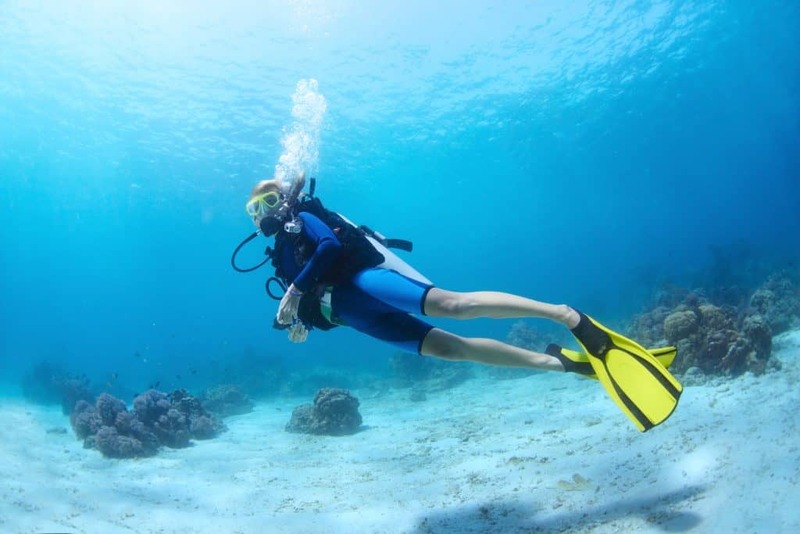 Most divers that do not live close to the water will need quite a while before they gain the experience to outgrow the capabilities of either of these two devices. Both dive computers use a rather conservative algorithm. Some divers complain about that, but reality is that these devices make sure you stay safe underwater. For beginners it should not be a problem. If you upgrade to a more sophisticated dive computer at a later point in time you might think of going for a model that has a less conservative algorithm like for example the ones from Oceanic. It rarely makes sense to buy a more high-end model right at the start. When a beginner gained enough experience to look the next level of dive computers, they will by then possibly have additional features that today’s models don’t have. Get the latest model of these more sophisticated scuba computers when you need one and keep your entry-level device as a backup. 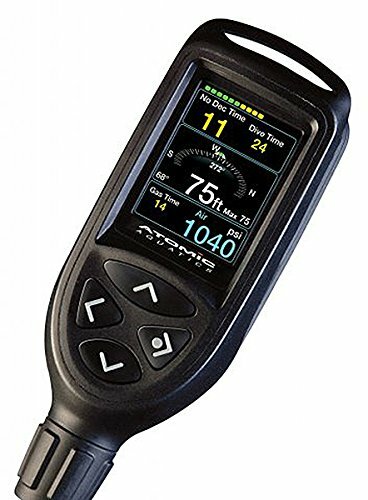 If you are looking for other dive computers, then check out our buying guide and list of recommended devices. We update these recommendations regularly as there are new dive computers entering the market all the time that offer better features or are easier to use. 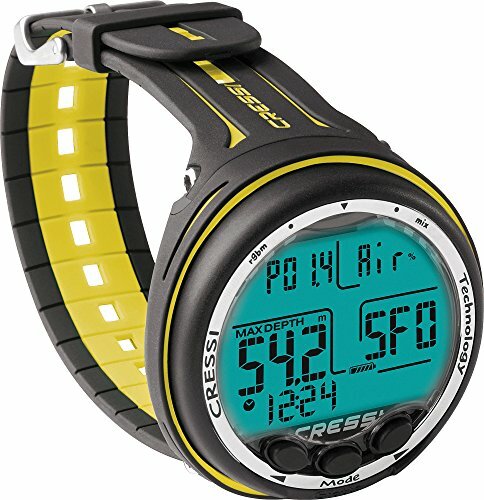 Cressi designed two dive computers themselves. The Leonardo and the Giotto. While the Leonardo targets the entry-level market, the Giotto targets pretty much any experience level in the recreational diving market. After giving them a first glance, you see they have quite a few differences. And no, that’s not only the price point. The Leonardo is cheaper by around $100 and is one of the most affordable scuba computers you can find. The price point of the Giotto but it does in return offer more functionality. The immediate difference you will see is that the Giotto has three navigation buttons vs. one on the Leonardo. This has advantages and disadvantages. It makes for a quicker and easier navigation through the menus as you can go back and forth with two of the buttons. The single-button navigation on the Leonardo forces you to step through each menu choice to get to the one you want to go. However, having a single button also has a nice advantage. You won’t press the wrong button by accident. That is true if you’re diving with thicker gloves. Having three buttons can make it a little hard to press the right one in that case. Assuming though that the Giotto is used by a more experienced diver also means that one would expect that the diver is calm enough to take the time to press the correct one. Both dive computers are very similar in size. They both provide a large and sharp display. The data displayed on the screen displays clearly and easy to read. The Giotto besides showing the standard data like depth, dive time, etc. also has a graphic CNS oxygen toxicity indicator. This measures and displays the oxygen toxicity level for the Central Nervous System (CNS). The Leonardo and the Giotto have user exchangeable batteries. They cannot be hot-switched, meaning the current data stays while you switch,but you don’t have to bring or send the dive watch to a service center or dive shop. This makes it easier to have a spare battery with you so you change it yourself if needed. They display the current battery level on the display of both models. The Leonardo provides the basic functionality you’d expect from an entry-level scuba computer. It allows to use one gas mix up to a 50% oxygen level. Being designed for a beginner, it does not provide the capability to switch from air to Nitrox during a dive. The Giotto can handle two Nitrox mixes up to 99% oxygen. To support more experienced and technical divers, you can switch between gases during a dive. It is also equipped with handling a Nitrox dive after a dive with air even if you’re desaturating. A feature that makes both models attractive for rental shops is that they can be reset after a dive. Many other dive computers don’t have this capability and at that moment they take data from previous dives into consideration when they calculate dive limits for the current dive. 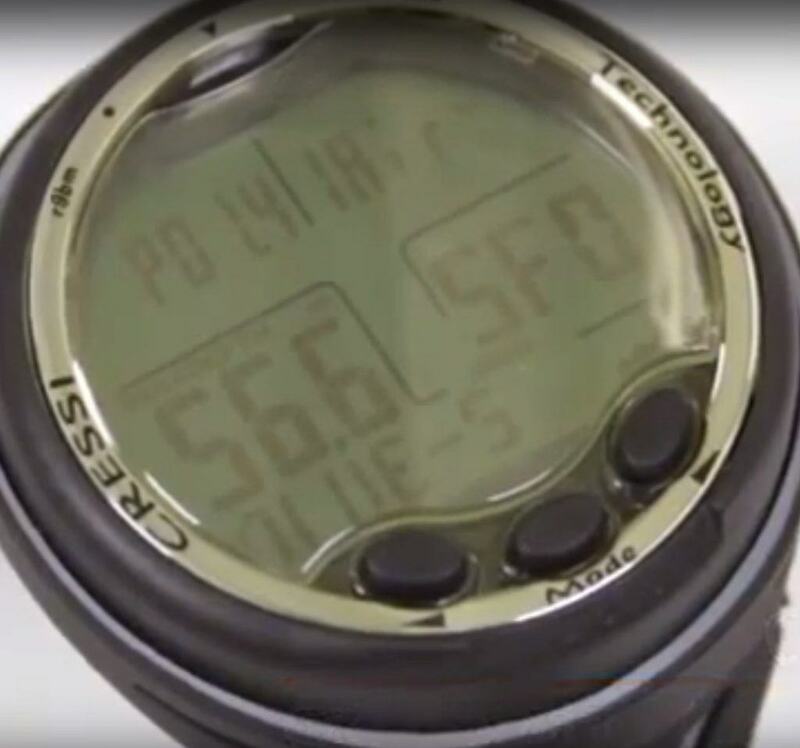 Both the Cressi Leonardo and the Cressi Giotto can be completely reset so they calculate the current dive without considering a previous dive. Neither the Giotto nor the Leonardo offer functionality you can find in higher end computers. Specifically, you won’t find any sort of air integration on these scuba computers. For most recreational divers this does not pose a problem. 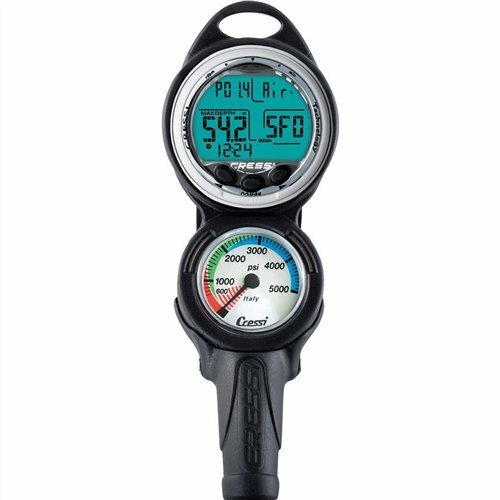 If you are a scuba instructor that needs to monitor the air levels of students or like the convenience of seeing your tank levels on your wrist, then neither the Giotto nor the Leonardo will be a good choice for you. The same is true for both devices not having an integrated compass. Both dive computers come in a console variant though instead of a wrist computer. The console is equipped with a second instrument which can either be a compass or a pressure gauge. Both the Giotto and the Leonardo come as consoles. They combine the computer with either a compass or a pressure gauge. While this is a tempting proposition, it also has its disadvantages. Go for the console if you want to see the data which can be tricky if you have your hands full, e.g. in an emergency when you help your buddy. It’s easier to look at your wrist in those cases. This comparison only highlights the major differences between the two models. You can check out our detailed review of the Giotto here. If you lean towards the Leonardo, then have a look at this in-depth review which should answer all your questions. If you’re a beginner and you know you will stick with the sport, then you might be better off investing the additional money into the Giotto. The additional functions allow it to grow with your experience. The Leonardo is a fantastic beginner and budget dive computer but it has its limitations when it comes to the functionality offered. Does it have enough capability to get you through your first 100 or even 200 dives? Yes, it does. Will you hit the ceiling with what it offers afterward? There’s a chance you might. If you’re able to pay a little more by getting the Giotto, then you push that ceiling farther out. You most likely will never run out of functionality on it if you’re recreational diving. A big advantage of the Giotto vs the Leonardo for more experienced divers is the three-button navigation. As a beginner it might end up being a little confusing to use three buttons to step through the different features but with some experience it’s faster and more intuitive. Before you buy any of the two models think about how long you might need to reach 100 or 150 dives. If that’ll take you a few years then go with the Leonardo. By the time you will require more functionality, there’s a good chance that the technology has evolved and you get a newer model than what is available today. If you think you’ll be able to reach that number in a year or two then opt for the Giotto. It offers what you need for the next years to come. There’s a good chance that there won’t be any significant technology changes by the time you reach the need to take advantage of the more sophisticated functions. Neither of these two models will be a good choice for divers that already have numerous dives under their belt and that look for features like air integration. There are numerous scuba computers available that offer all the bells and whistles. Have a look at our overview of the best dive computers you can get. You can find this selection of top products here. If you’re furthermore interested in devices that compare tothe Leonardo then we have done several other comparisons that might be of interest. First, we compared the Suunto Zoop Novo to the Leonardo. Both are entry-level devices that match up pretty closely in their capabilities. You can have a look at the comparison to get the information to make a good buying decision. Eager, first-time divers, want to know everything about their newfound hobby. We’ve got the scoop for you on everything you need to know about dive computers. A dive computer is your digital writer lifeline, allowing you access to real-time information for the perfect dive. Being able to read the dive computer with your mask on. Is your dive computer going to be compatible with your equipment? Do you 100% understand the information you’re reading? If not, you’re putting your life at risk. When going diving you need to have a good idea where you are and where you’re going underwater. Having supporting equipment to help with navigation is important for your safety. The more pressure you find yourself in, the more disorienting it can be. No matter how much you think you know, under the water is another story. Navigation is critical and owning a dive computer with an old-fashioned compass is pivotal in your safety. Without this, you may not know how to get to shore, or back to your boat for safety. Without the life-saving component of a depth gauge, you may wander a little too far down to where you’re too disoriented to function and ask for help. A depth gauge works hand in hand with your decompression stops and calculates how much time you spent at a particular depth. If you’re left guessing, it will negatively affect your calculations for decompression stops. When you’re at a low depth, it can be hard or near impossible to make any calculations yourself while functioning in the water world around you. Dive computers take out this stressful aspect for you and perform the calculations for you. These life-saving calculations work alongside decompression calculations, decompression stops, and specific models offer calculations of no-fly times for those who are diving on vacation. It sounds morbid, but when you ascend in a plane after diving into a certain depth, the nitrogen in your body will expand because of the pressure. You may explode! (No, seriously, it’s a thing and you need to adhere to some safety precautions). Some dive computers will let you know when you can safely fly again. Most modern dive computers will have an onboard memory feature for you to review all the information stored away during your ascent into the aqua world. It’s a nifty little feature and can help you predict and plan for future trips down. Any dive computer bought will have to go through an activation process, much like a phone. Thankfully, you don’t have to activate your phone with water, though! There are two ways to enable a dive computer for beginners including manual or water activation. The manual option requires the diver to press a button before going in the water. If you’re new, I should forewarn you that many divers FORGET this aspect of preparation, causing companies to come up with a solution that allows instant water activation as soon as divers are in. Now that you’ve got the scoop on the different life-saving and data recording components, we’ll go over our top three picks (and our top recommendation!) 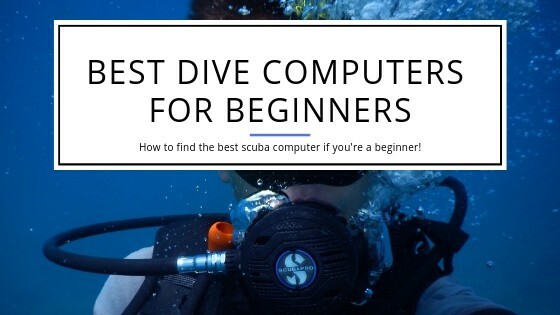 for the perfect dive computers for beginners. Not only does this dive computer give you a readout for the different depths during your dive, but you can also read these numbers with no issues at night. The backlit screen function allows for safe tracking during dangerously dark dives. This device also has a data reset feature, which is perfect for rental companies working with beginners. This may be the only downside, as beginners may accidentally stumble into this section and delete their hard-earned data. Another significant aspect of this computer dive watch is the audible and visual automatic safety stop countdown at 15 ft or 3 minutes. A wrist-held safety buddy, there’s no real reason you shouldn’t purchase this as a beginner! This dive computer has a 24-month limited warranty. The Suunto Zoop Novo is the successor of the Zoop. 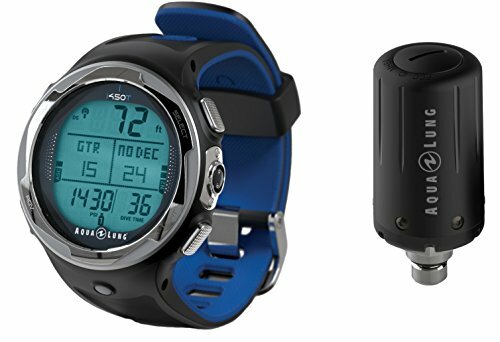 It’s gotten a little bulkier and has several added features and functions compared to the first version of entry-level wrist mounted scuba diving computers by Suunto. The size is overall easy to manage and navigation is super easy with four dedicated buttons placed around the display. Both other devices we listed in this guide have a single button for navigation. At first glance this is an easier design, but it has a disadvantage. If you page through the different menu options with a single button you have to step through each option as you cannot go back and forth with a single button. A design with multiple buttons lets you go back and forth as needed and can make it easier to get to where you want to be in your menu options. Having a single button simplifies the overall handling but can make it a lengthy process to get where you want to be in your navigation options. This is a no-nonsense dive computer with all essential features and functions for a beginner. It’s easy to use and makes it easy to read the information on the display. The back light is strong enough to allow you to read the data on the screen in dark and murky waters.. The computer uses Suunto’s own RGBM algorithm. This specific algorithm is seen as rather conservative. You can adjust the algorithm if needed, but that only allows you to make it even more conservative. The Suunto Zoop Novo is a great scuba dive computer, and it’s hard to find real negatives about it. You won’t get all the bells and whistles but that’s what you’d expect from an entry-level device for a beginner. It offers all the required basic features and you’ll be diving for a while before you look at any higher-end functions. Our in-depth review of the Suunto Zoop Novo can be found here. Please check it out if you need any further detailed information. 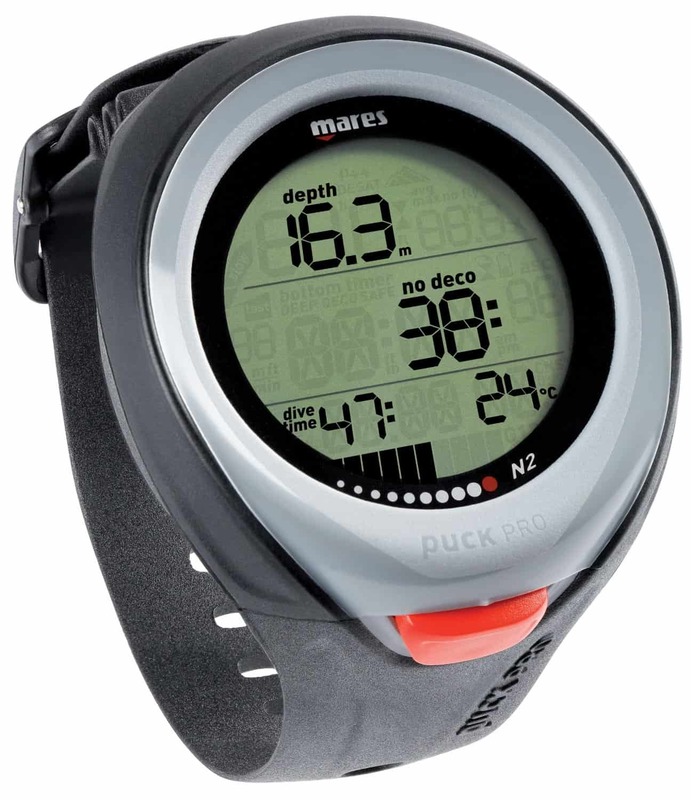 The Mares Puck Pro Plus is the latest rendition of the original Puck scuba diving computer. In case there’s any confusion about the name, it refers to a hockey puck regarding shape and size. 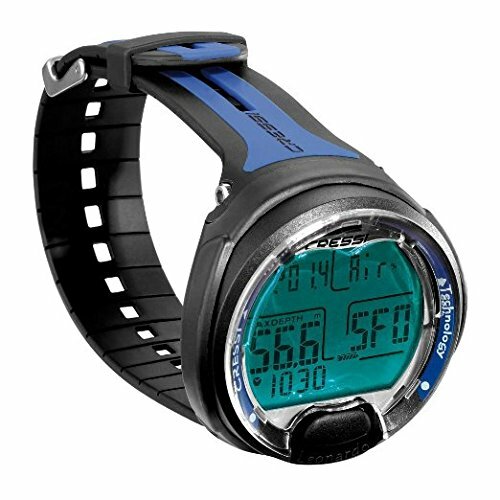 You can find many other wrist mounted dive computers that are smaller or that you can even wear as your daily watch. If that’s your criteria then the Puck Pro Plus is not the best device for you! The biggest improvement Mares had in store for the Puck Pro Plus is the Bluetooth connectivity. No more cables required to exchange dive data with your computer! The display received a few minor changes and is as excellent as it has been on the Puck Pro. Large numbers that make it easy to read combined with a strong back light so you can still see all information in dark environments. 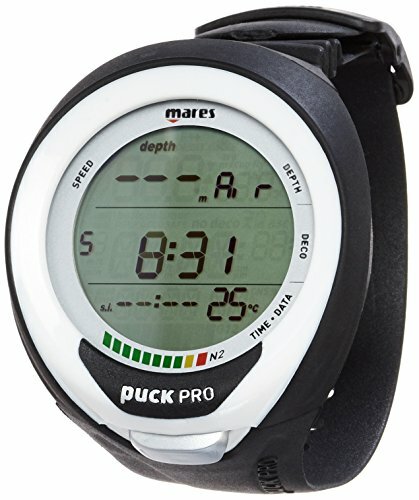 The Mares Puck Pro Plus is a solid contender with all necessary features and functions you’d expect from an entry-level scuba computer! If the Mares Puck Pro+ is a scuba computer that is of interest to you then check out our in-depth review! We think the best dive computer for beginners is the Cressi Leonardo. While the version with the stand and USB connector are nice, it’s not a necessity. You might as well save yourself some money and go with the basic model without all the connectivity items. You’d thought we would recommend the last one? While the added features are helpful, they aren’t essential to most dives, and you can get those higher end features with a more complex device at a later time. For beginner divers, it’s important to feel out the piece of equipment instead of splurging on the biggest package possible. If you enjoy this watch and want those added features of a download cable and stand, those accessories are available online. 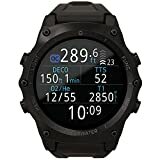 For beginners, this watch is fantastic. With large fonts, sounds, and all the readings you can hope for no matter the time of day, the Cressi Leonardo hits the nail on the head. 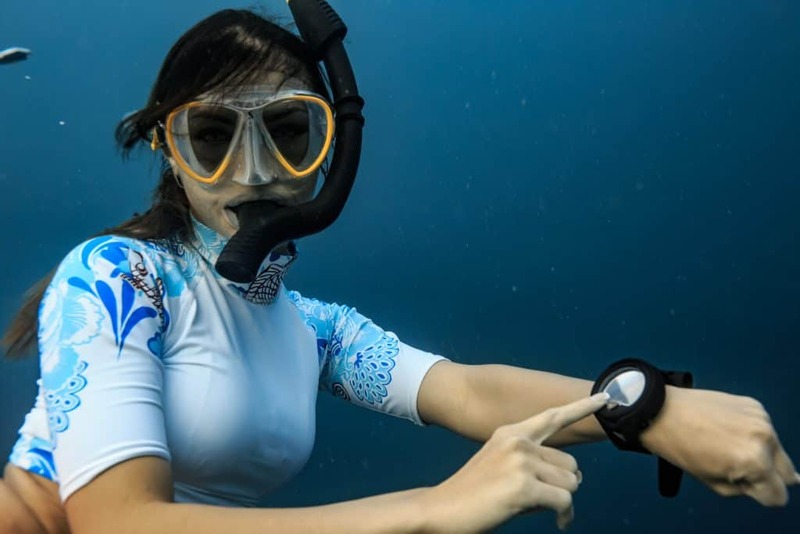 Computer technology has brought significant developments in diving safety, performance, and convenience–advancements symbolized by the sleek, Bond-like multi-purpose computer wristwatch. The future is here, and it’s under warranty. As an experienced diver, you are prepared to invest in your equipment and knowledge to do the research necessary to sort through available options and features. In this article, we’ll review Shearwater Research’s Teric wrist-mounted dive computer and see how it compares with the competition. Even experienced divers vary their locations and technical demands—and we all seek flexibility and the convenience of automation. 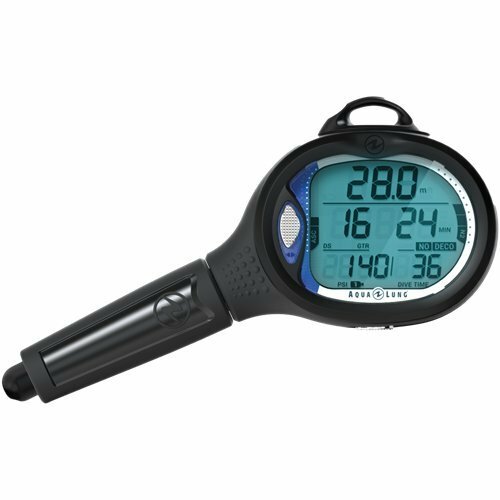 A quality dive computer requires solid performance and monitoring capacity, preferably in a unit that adjusts to the conditions of your dive. Reliability is non-negotiable for diving equipment. You want a well-designed model with a solid warranty from a reputable manufacturer: preferably one with experience in the advanced diving market. A dive computer should be well-designed and constructed to resist corrosion and degradation from routine wear. Only you can decide upon the versatility you need, so match those needs against your final selection. You will enjoy the ability to customize features, but without sacrificing technical precision or craftsmanship. Some wrist-mounted dive computers with broad applicability lack the specialization you need, so you’ll have to decide what matters most. Don’t forget the day-to-day experience either! Consider the intuitiveness and usability of the menu system and display, and the level of automation you desire. Ideally, you’ll find the right balance between the precision and control you need, and the automation and convenience you want. The Shearwater Research Teric is a high-performance technical dive computer housed in a distinctive and attractive wristwatch. It is made with recreational divers in mind but includes high-end technical capabilities for versatility and range. The Teric is simple to operate, but its complexity is over-the-top for beginners. If you’re experienced and know what you need, however, this unit puts style into cutting-edge performance. The unit’s five dive modes cover depth conditions of up to 656 ft (200m) and automate everything from turning itself on to tracking your dive parameters and uploading your log when done. Since the Teric provides performance and versatility in a great-looking wrist-mounted computer–along with its loyal customer base and early adopter interest–it is unsurprisingly priced at a premium. There are cheaper computers you can find. As a quality instrument, however, it makes sense to consider the Shearwater Teric more closely. As an added consideration, the Teric can quickly change its face to double as a land wristwatch—it’s a downright bargain when viewed as part of the market for high-end timepieces. The Shearwater Teric comes with five different diving mode settings for versatile performance, so you can quickly change the configuration according to your intended dive. You can configure specific sampling rates for different kinds of diving, and monitor time-to-surface numbers for pre-planned gas switches. The Teric allows you to program unique mixes for each mode, with multiple gas definition presets for any combination of nitrogen and oxygen, and also helium for use in other than the recreational mode. For use during no-decompression diving activities. This mode can monitor three gas mixes and uses nitrogen and oxygen only (no helium). The setting includes an adaptive safety stop and No Decompression Limit (NDL) Bar Graph so you can see how much time you have before a mandatory decompression stop. Enhanced warnings keep you informed about your limits during a casual dive. For use on technical dives, including planned decompression. 5 OC gases with full Trimix enabled by default. There are no safety stops, and Time-to-Surface (TTS) is prominently displayed throughout the dive. 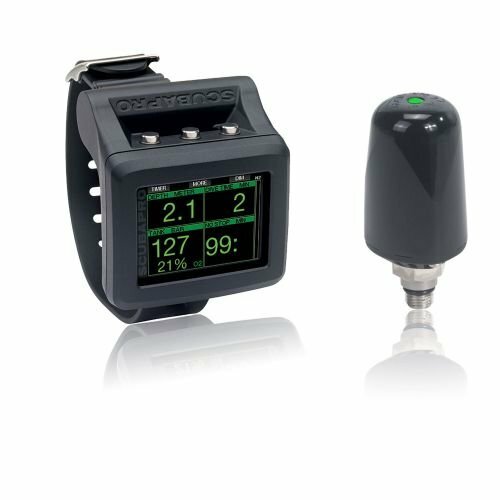 Designed for monitoring a closed-circuit rebreather, with Bail-out (BO) operation and quick switchover to Open Circuit use. Constant PO2 is maintained to minimize decompression restrictions, and you can program up to 5 OC/5 CC gases. 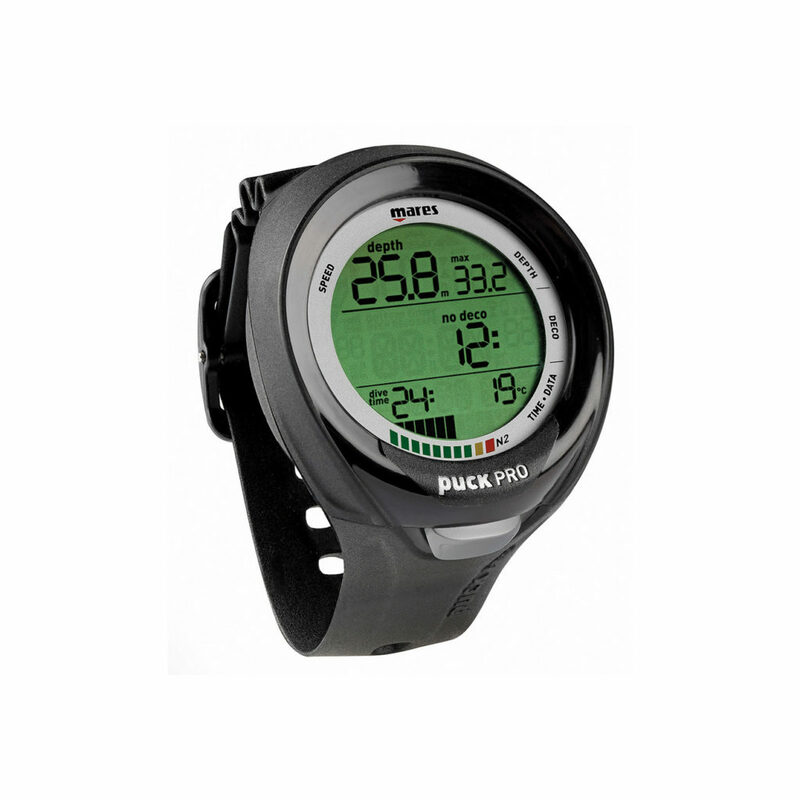 Simple monitoring of dive time and depth, with resettable stopwatch and timer functions. No tissue tracking or decompression monitoring. 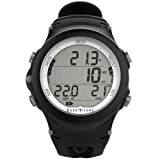 This mode shares most features of the other dive modes, with the addition of special monitoring that applies to free diving. 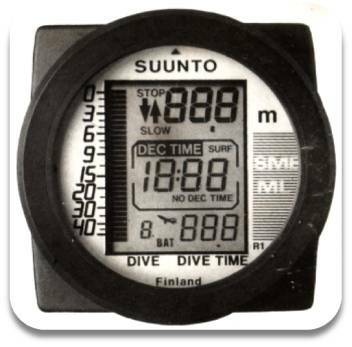 The large layout format is enabled by default and displays the Last Dive Time and Max Depth. 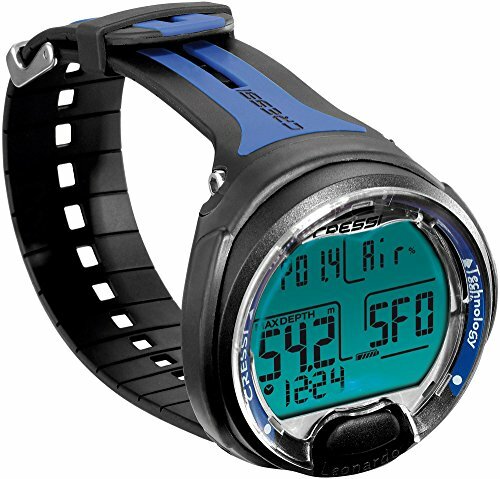 Ascent and Descent indicators can be set in 1-second intervals. 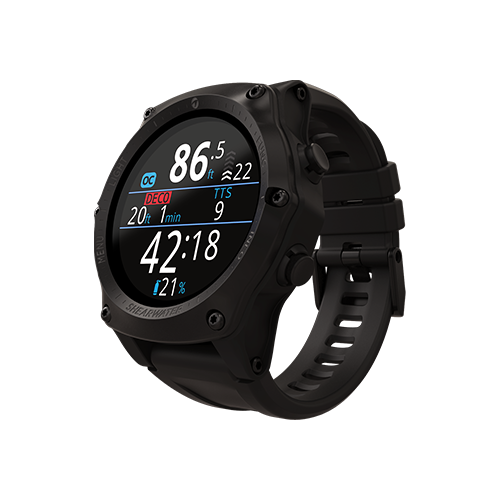 The Teric inherits and advances the innovative screen functions of its predecessor, the Shearwater Perdix, a unit well-regarded for its readable and intuitive display. A Sizeable 1.39 in (35mm) AMOLED screen offers a vivid full color, high-resolution display that is easy to read underwater. The sapphire crystal face is highly scratch resistant: it rates as a nine on the Mohs hardness scale, just below diamonds. The casing buttons and bezel are made of 316 stainless steel, so you don’t have to worry about rust or salt corrosion. The 4-button Teric interface is even easier to navigate than the 2-button Perdix menu system. You can also program one button for single-press access to specific functions for quick access to your most useful tools. You can configure the screen to different layouts and font sizes, and to display the exact information you want to see at a glance. 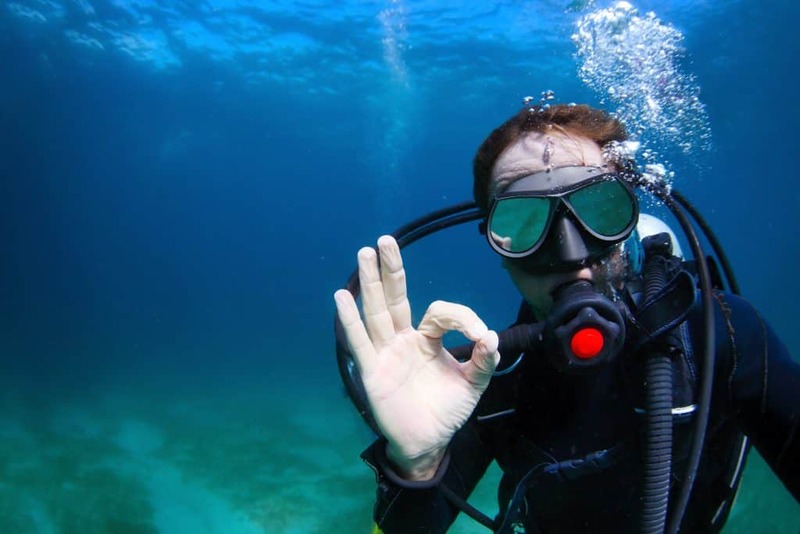 Alarms can be set for either haptic (vibration) or audible alerts, so you can choose your preferred method and avoid bothering nearby divers too. Besides dive alerts, you can set 2 independent alarms to trigger daily, with options for weekdays/weekends and adjustable snooze time. The Teric provides a three-axis, tilt-compensated digital compass. Its readings show on the outer edge of the display. You can configure the home screen, so the information you most need is conveniently displayed. Another handy feature is the ability to change the watch face for use as a regular wristwatch. There are three faces–Digital, Analog, and Orbits—and you can set over 100 possible configurations using the three information levels and different faces and color combinations. The Dive Mode automatically switches to Watch Mode after 15 minutes on the surface. It will remain powered, but the dive computer turns off its main functions after 20 minutes if no motion is detected. 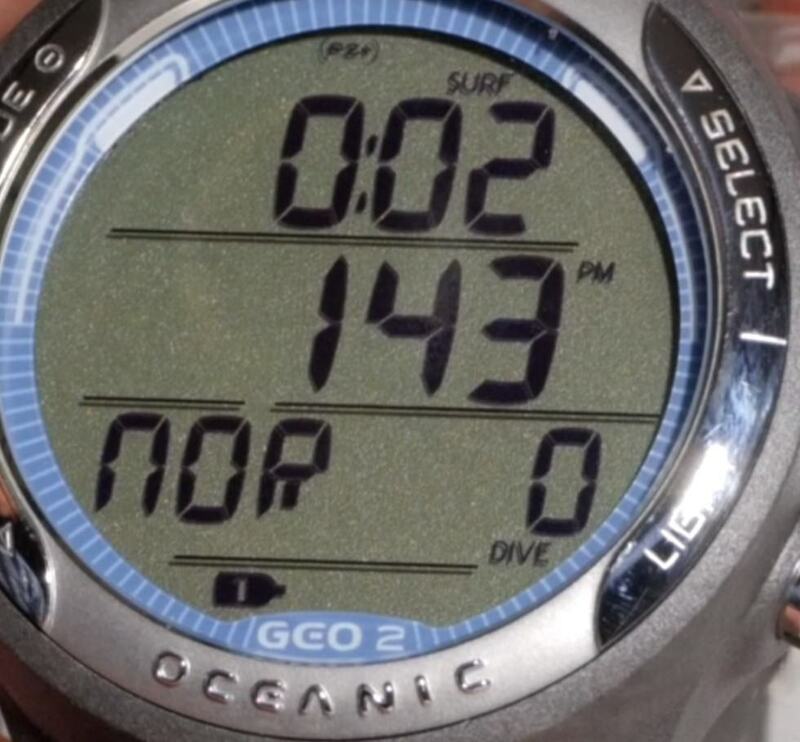 The Stopwatch setting operates across all dive modes and runs up to 24 hours even if turned off. 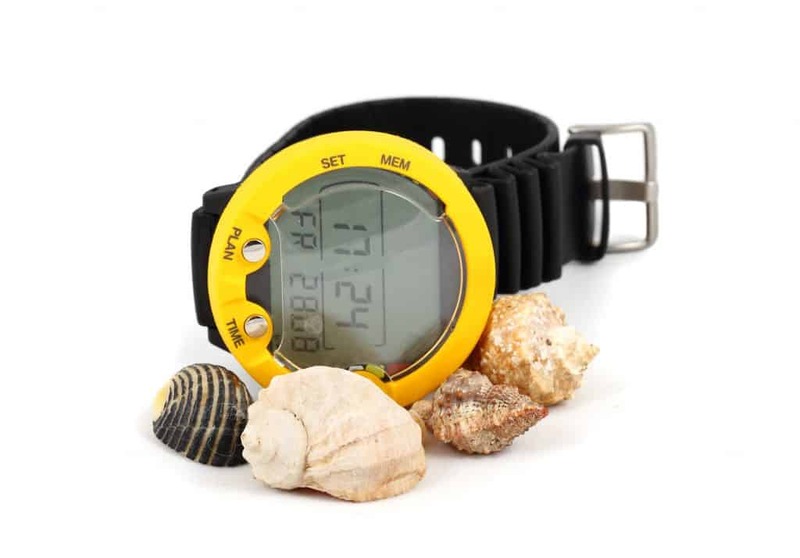 There is a Timer function too, and a Flashlight setting that brightens the display—it won’t illuminate the ocean deeps but may be useful at close quarters in low-light conditions. The Teric is powered by a lithium-ion battery rated for 5+ years of use. It is wirelessly recharged in about 1.5 hours when using the docking station, and can also be charged with most Qi-compliant pads. Depending upon the settings, a single charge lasts from 30 to 60 hours. One inconvenience is that the battery requires a dealer to change. No swapping out spares, so you need to remain aware of the battery status. The Teric is equipped with Bluetooth Smart technology so that you can upload your dive logs automatically to your preferred device. It’s compatible with Mac, Windows, iOS, and Android, making it easy to update your system and manage your information. The Teric comes with a 2-year warranty, and Shearwater Research has a positive customer service record. Each Teric has a unique serial number that doesn’t require registration and can be transferred if sold. The Teric can connect wirelessly with up to 2 transmitters, but you must purchase this equipment separately. The feature can be added at any time, however, if you aren’t sure about making the outlay quite yet. The wristband comes in several optional dual-color schemes you can purchase additionally: Pink, Blue, Green, White, and Yellow. The straps are interchangeable with any 22 mm watch band type. 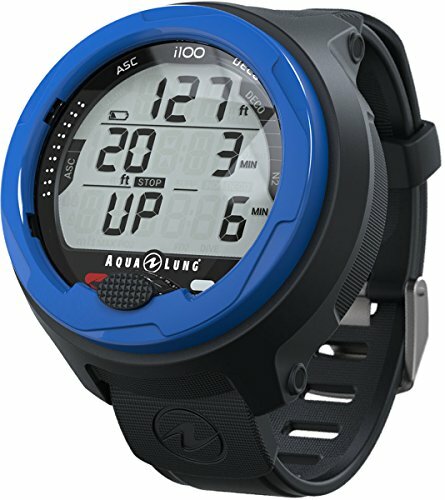 The Aqua Lung i450T is a wrist-mounted dive computer introduced in 2016 and remains one of the excellent competitors to Shearwater’s Teric. The 1450T was stylish for its time and shares the theme of flexibility and convenience the Teric has developed further. The i450T features four diving modes, lacking the CC/BO rebreather mode and higher automation of the Teric’s recreational settings. The display is intuitive and easy to read, though it lacks the color and highly customizable interface that makes the Teric stand out visually. The i450T excels at air integration, offering control of up to 3 transmitters instead of Teric’s dual capacity. Its battery is replaceable by users too, so you’ll be saved a trip to the dealers when its time to change. Overall, Aqua Lung’s unit today represents a pared-down feature set when compared to the Teric, but it’s a reliable tool at a slightly lower cost. 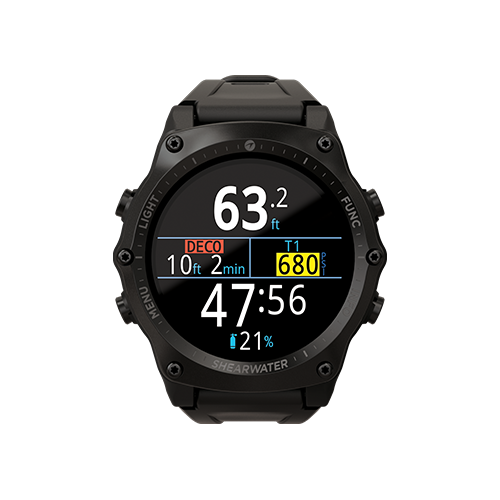 The Suunto D6i Novo is an established wrist-mounted dive computer that is a close competitor to the Teric and comes with a similar price tag too. As an older model, it has a bit less under the hood than Shearwater’s latest effort, but it is well-tested and reliable. 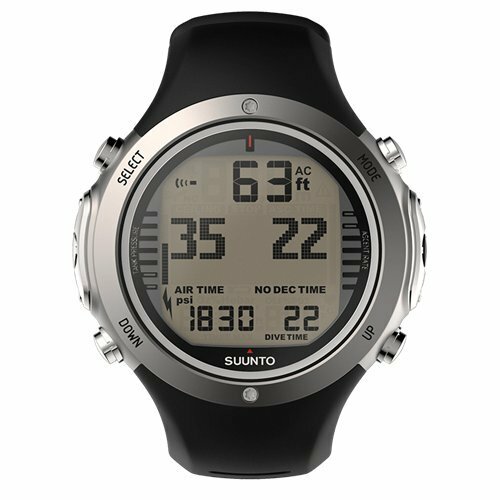 The D6i is excellent for free diving, and the longtime market presence of Suunto makes it easy to find assistance across the world. It doesn’t have a mode for CC/BO rebreather tech, but it has similar automation to the Teric—including an optional transmitter and the need to have its battery replaced by a dealer. The D6i has a duller, black LED face, and small buttons that have been known to stick without extra care. The D6i is well-regarded by professionals, and it’s in the same price range as the newer Teric. It doesn’t have quite the same level of digital integration or automation, but it’s still a solid choice if you have the budget. The Oceanic Oci is an older model that combined the technical advancement of the OC1 with the stylish and popular OCS model. 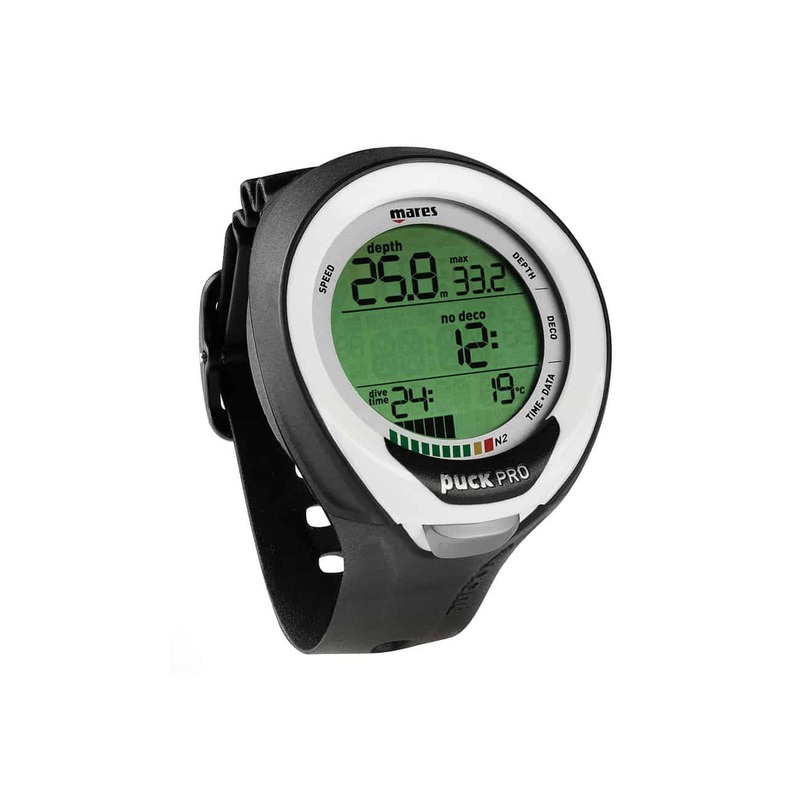 It is in the same price range as the Shearwater model, and looks great and performs well. 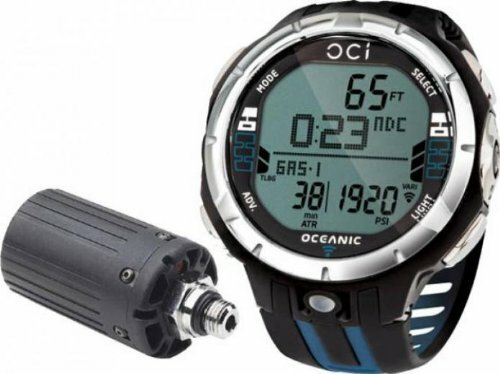 Though it lacks full-color display or the Teric’s versatility and range, the Oci is established and offers all most recreational diver’s need. 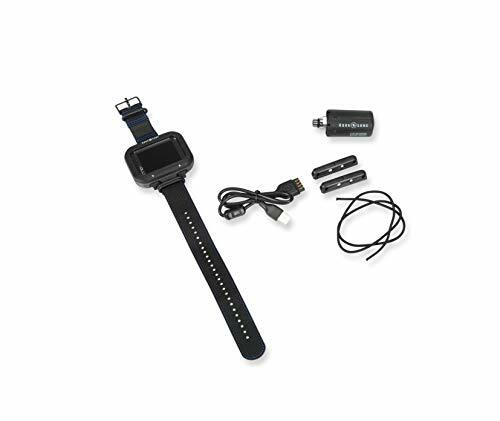 You get four wireless transmitter capacity, and user-replaceable battery power, and an established customer base. The Oci package includes the transmitter, which makes it more affordable than the Teric if you need air integration. It’s an older model that compares favorably concerning reliability, and its slightly smaller feature set present a less complicated tool for less experienced divers. It’s hard to keep up with the latest innovations: you want the best of essential advances while avoiding the gimmicks. An advanced diver can’t sacrifice precision and reliability, but versatility and ease of use are critical for day-to-day convenience. Good looks don’t hurt, and the Shearwater Teric offers it—along with the solid performance demanded by experienced divers. The Teric represents the next generation of dive computers and gives the flexibility to meet most diving techniques and occasions. It’s a diving computer with style. Check the Teric out for yourself! Leave your thoughts in the comments below! We love to hear from you and see you share your experiences below!